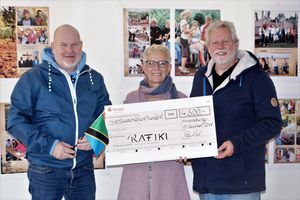 A donation for the KIUMAKO in the amount of 4500 Euro has brought teacher Anja Stenhüser to the responsible person of the RAFIKI e.V. Oliver Zantow and Marcus Wack. 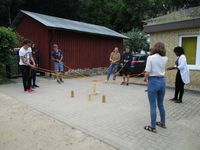 The money was collected as part of various initiatives and projects at the Selma-Lagerlöf secondary School in Arensburg.The Selma-Langlöf Secondary School has been one of the very active supporters of RAFIKI e.V. 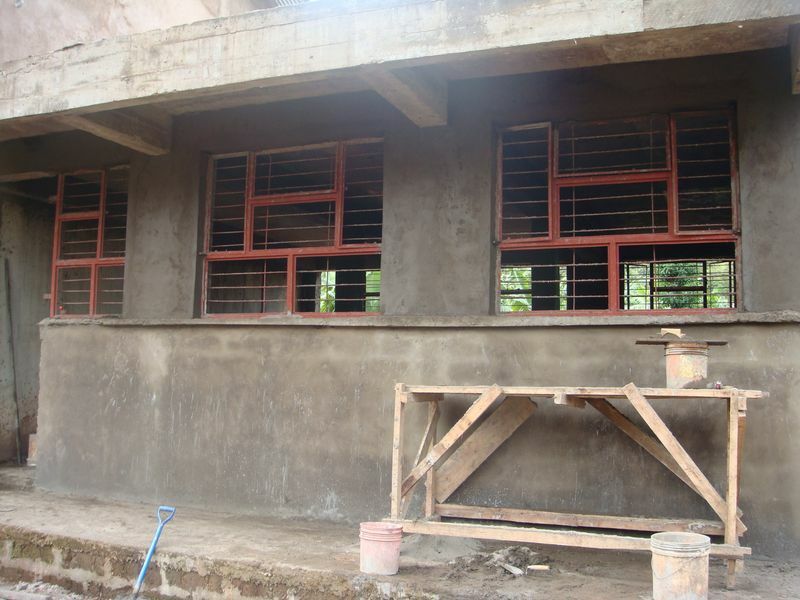 for many years and has been contributed to the school construction in Maribo with numerous. 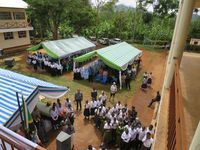 After fifteen years construction time is the KIUMAKO School finally completed and inaugurated. 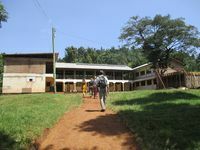 The School was under the direction of the RAFIKI e.V. 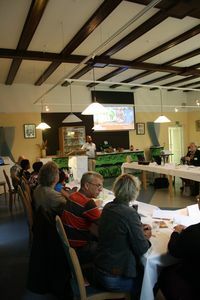 with financial support from the BING environmental lottery such as numerous donators and supporters from Schleswig-Holstein created. 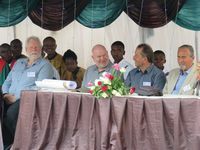 Accordinaly with the chairman Oliver Zantow and Marcus Wack, Klaus Karpen and Willfried Happe representatives of the Kiel/Kellinghusener association RAFIKI traveled to Mrimbo from the inauguration ceremony. 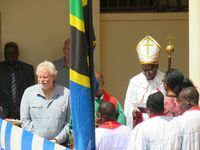 Bishop Mosha accompanied by many other dignitaries of the region, the inauguration ceremony before. 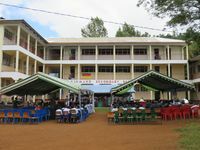 The at the time 80 students present their equipped school building to many Guests. 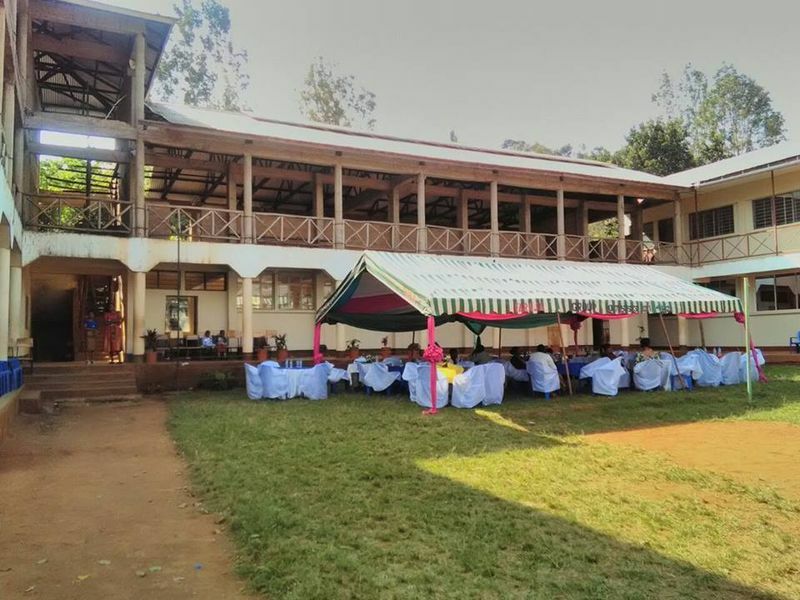 A traditional feast with goat and Chagga-Cake contribued just as well to a succesfull celebration as numerous perfomances of the students. 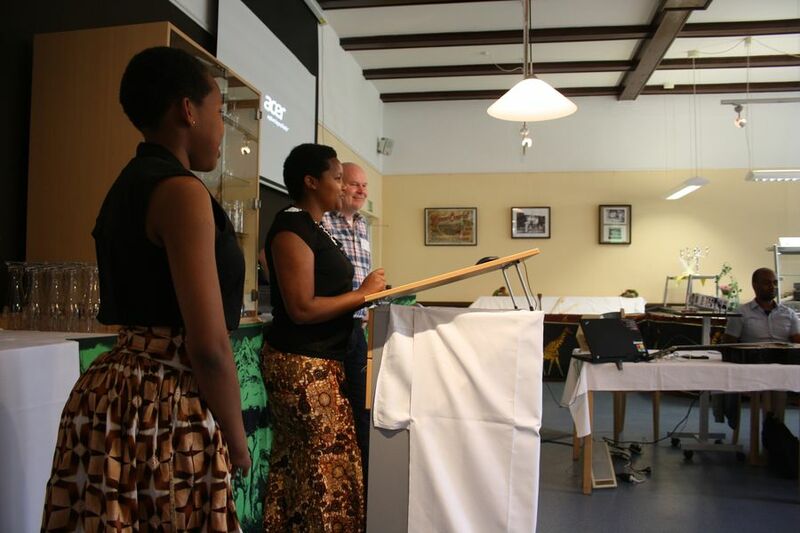 Under the direction of Marcus Wack, a team of lectures from BiBeKu GmbH and RAFIKI e.V. 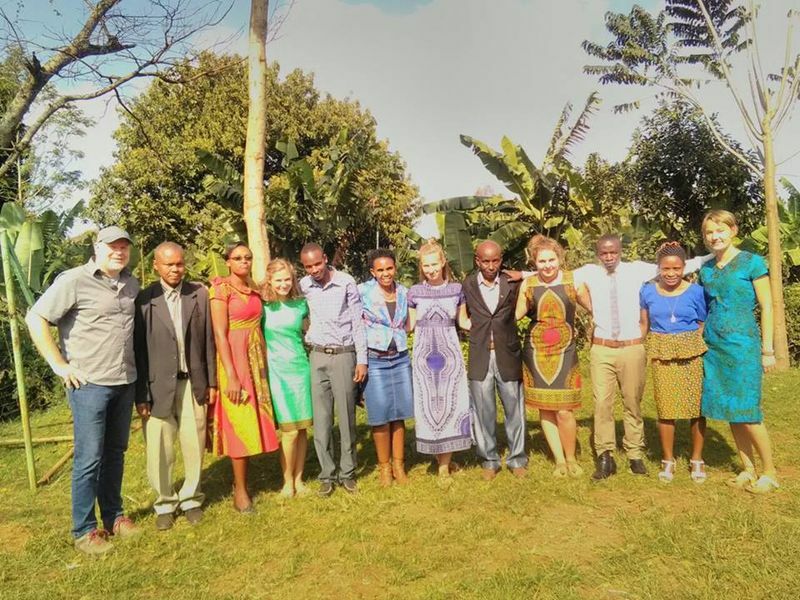 had invited eighteen young federal volunters to their intermediate seminar in Bagomoyo/Tanzania at the beginning of February. 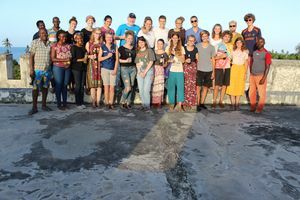 The young people between the ages of 18 and 22 complete their voluntary service as part of the federal program WELTWÄRTS in Tanzania. 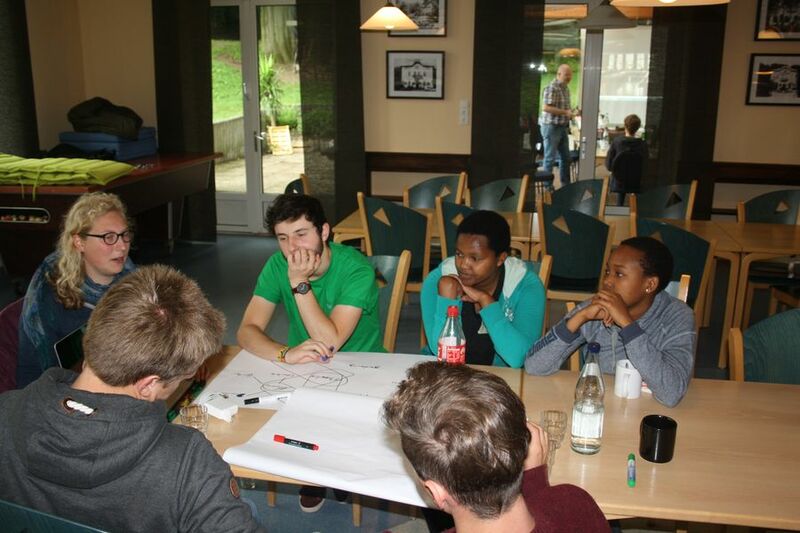 The coordinating sendingorganizationis the Jugendrotkreuz Westfallen/Lippe, while the RAFIKI e.V. 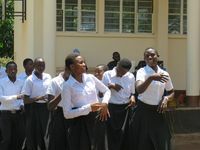 as welll as the Tanzasien Red Cross act locally as host organization and employment agency. 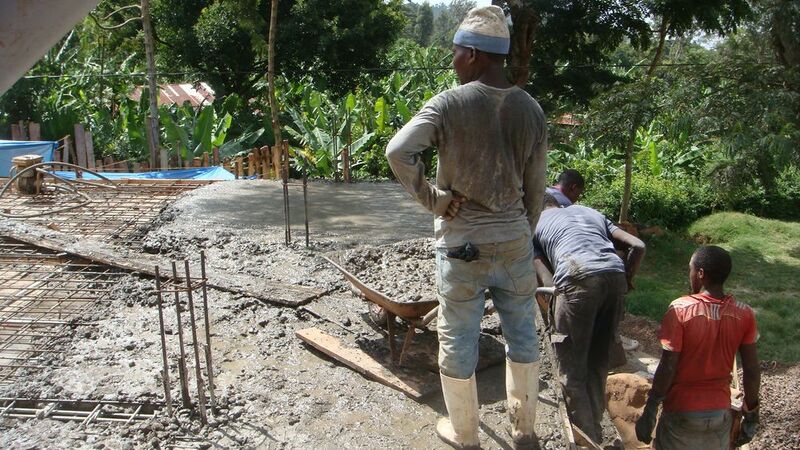 The job sites themselves are spread over Tanzania in Musoma, Bukoba, Mwanza, Moshi, Mwika or Daressalam. There, local youths at Primary and Secondary Schools supports the afternoon offer, in the various branches of the TRC in the first aid training, when working with street children or the medical service. After half of assignment, there will always be an intermediate seminar focusing on the reflection of the first as well as the outlook and planning for the young people, together with the teachers Brtitte Schmidt, Mareike Hegemann, Upendo Towo, Gilbert Towo and Marcus Wack, learned more about the history, culture and society of the host country Tanzania at a significant historical site. 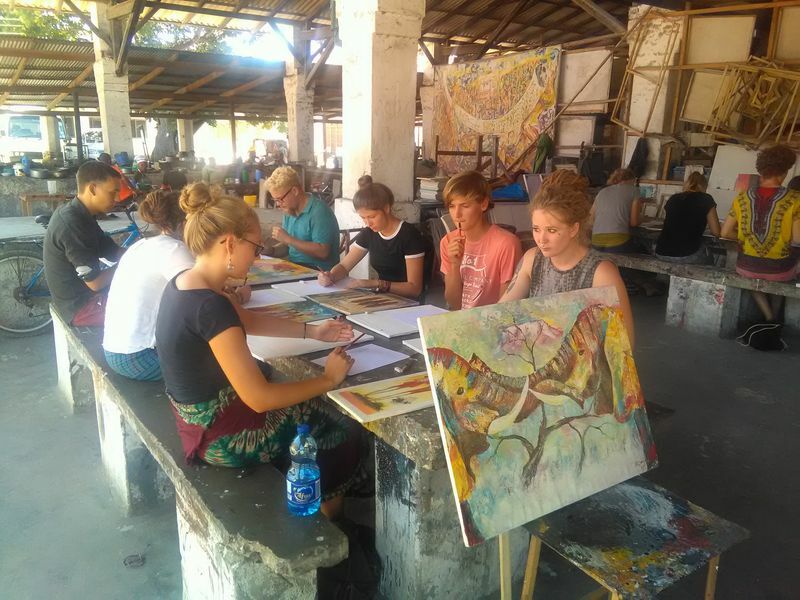 Guidedcity tours through the historic old town a visit to the College of Art and Media, a painting course in the Bagamoyo Art Market for graduates of the art academy, as well as various working groups on the concrete activites in the projects of the young people were part of the program for more then five days. 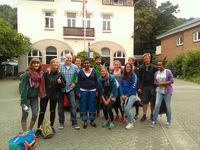 The volunteers of the generation 2016/17 are departed. 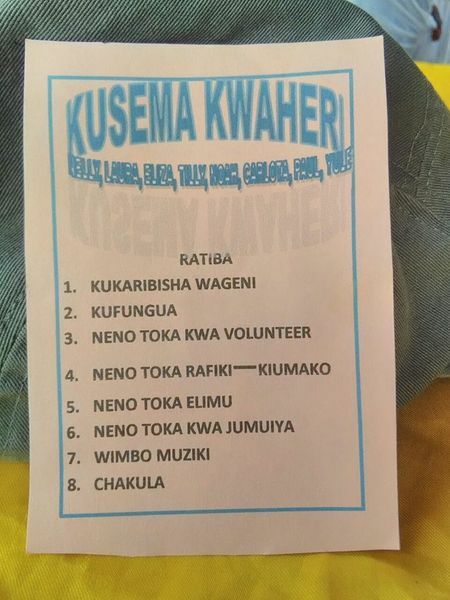 Before that the eight teenagers of the RAFIKI and the ELIMU association had a big celebration at the area of the KIUMAKO School where they dismissed students, parents, teachers, headmasters, market women and many other women. 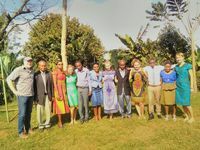 In their closing speech, which they held together, they presented once again their outstanding knowledge of Swahili and thanked for the great acceptance which they got from the people in the region. 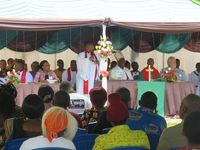 There were also many other speeches with a lot of words of thanks, among others from headmasters and pastors. 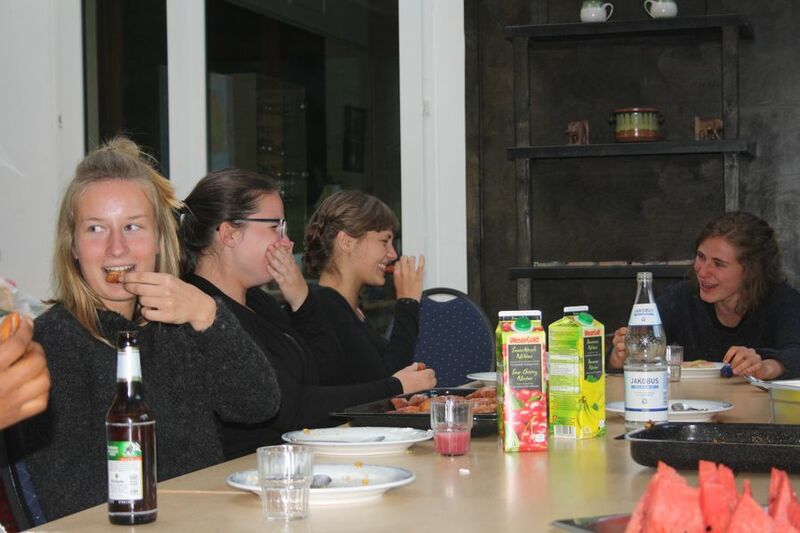 The two associations are also thanking for the brilliant service of Laura, Nell, Charlotta, Elisabeth, Jule, Noah, Paul and Tyll. In the end of their voluntary service Jule and Laura finished building a basketball court for the students. 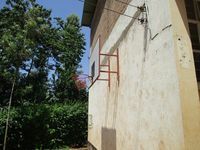 Through the building of a second basket the stundents of KIUMAKO can play regular games now. 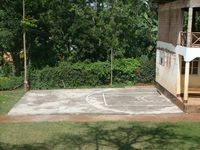 Previously the court was fixed in its whole length and therefore represents one of the most professional basketball courts in the entire region. We are mourning about Sabbath Kimaro, our headmaster of the KIUMAKO Secondary School. He died today after a short disease. 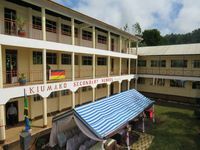 Our thoughts and our compassion are with his family and colleagues of the KIUMAKO Secondary School. Sabbath Kimaro had a huge influence and amount of the advancement at the school and its establishment as a Secondary School. Especially through the contact with the German volunteers he showed a lot of instinctive feeling and was always a capable and descisive partner to all of us. 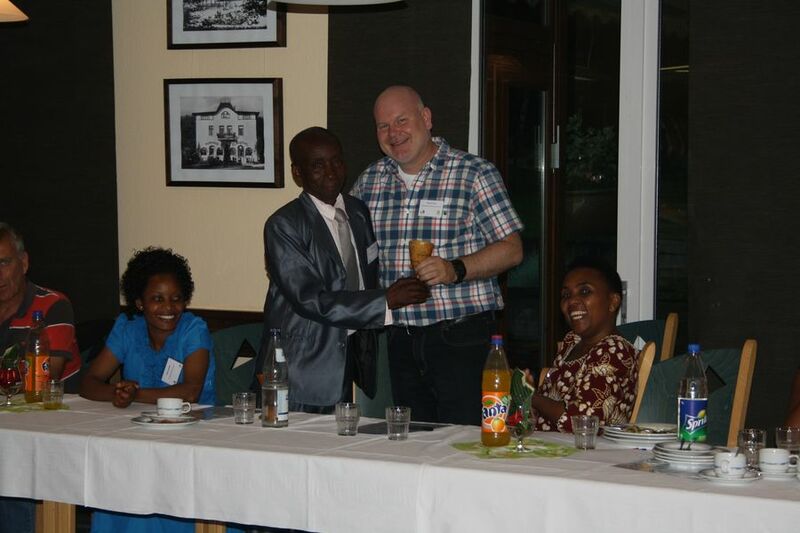 We will keep Sabbath Kimaro in our memory as an open-minded, humorous and very interesting dialog partner. At the beginning of July seven volunteers of the federal volunteer service WELTWÄRTS prepared themselves for their service at the RAFIKI association in Mrimbo/Tanzania including the KIUMAKO Secondary School. The workshops for their preparation lasted over ten days and took place in Münster and Kellinghusen. Since this year the Jungendrotkreuz Westfalen-Lippe is dedicated to RAFIKI as a WELTWÄRTS organization. 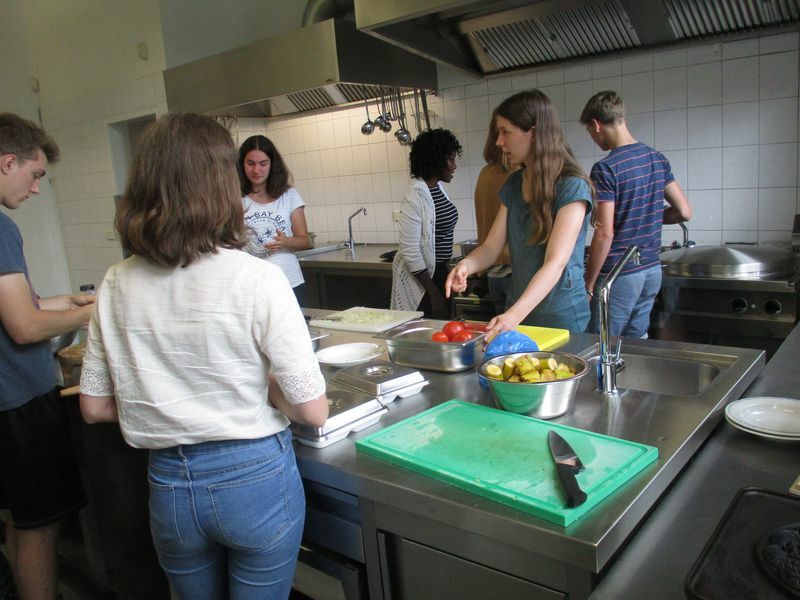 In Münster they organized the general preparation for the volunteer service. 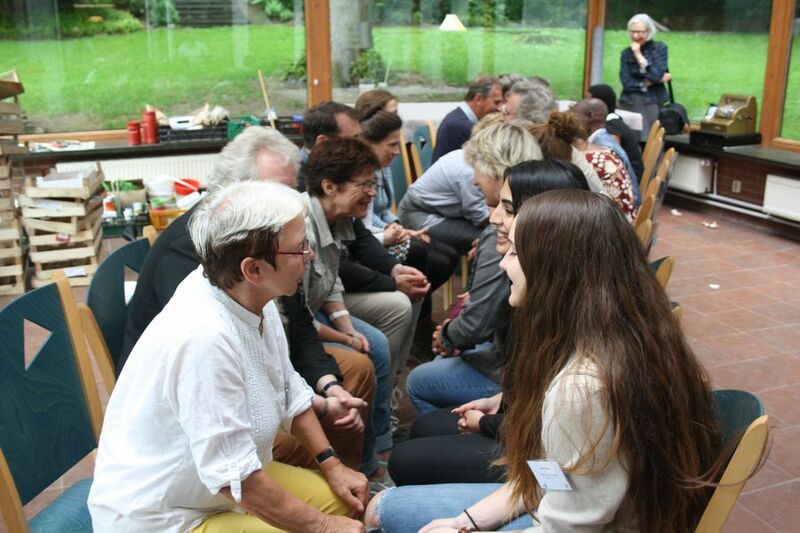 After a short time the seven teenagers in the age between 18 and 21 met again in Kellinghusen at the rooms of BiBeKu. 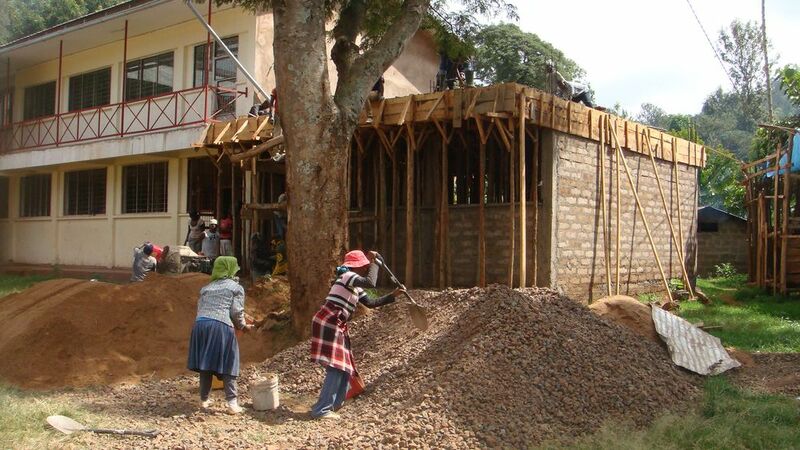 There they were prepared specifically for their service in many projects in Mrimbo from members of BiBeKu and Rafiki. 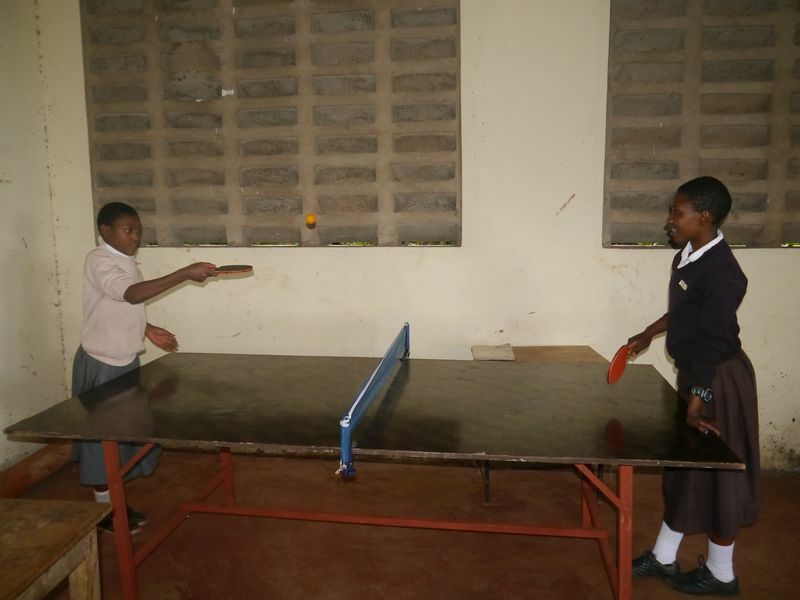 Cooking of school lunches, different art, sports and music activities as well as environmental projects are still the focus in this year, especially in the afternoon program of the cooperating Primary and Secondary Schools. 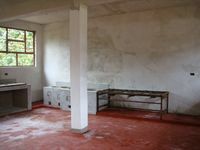 Furthermore there will be gaming and art activites at Kindergartens and in a facility for developmentally challenged children. 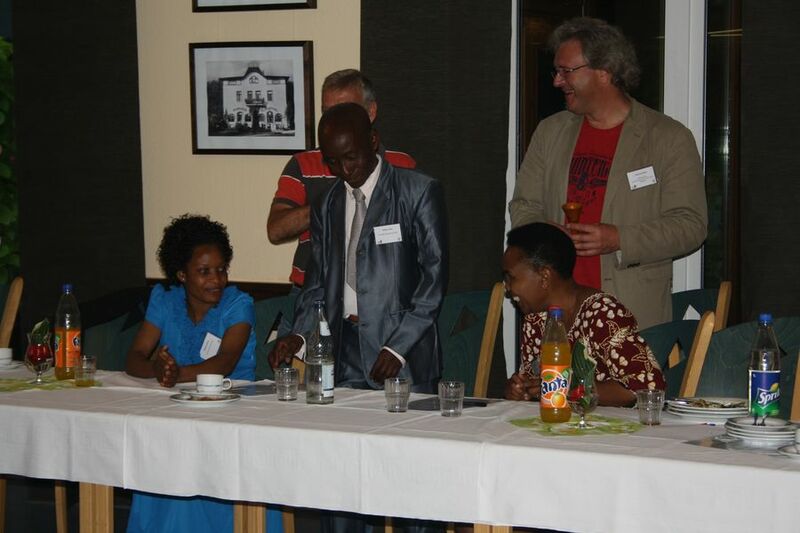 The service of the volunteers is especially supported through the commitment from the German partnership associations RAFIKI (Kiel/Kellinghusen) as well as ELIMU (Heikendorf). 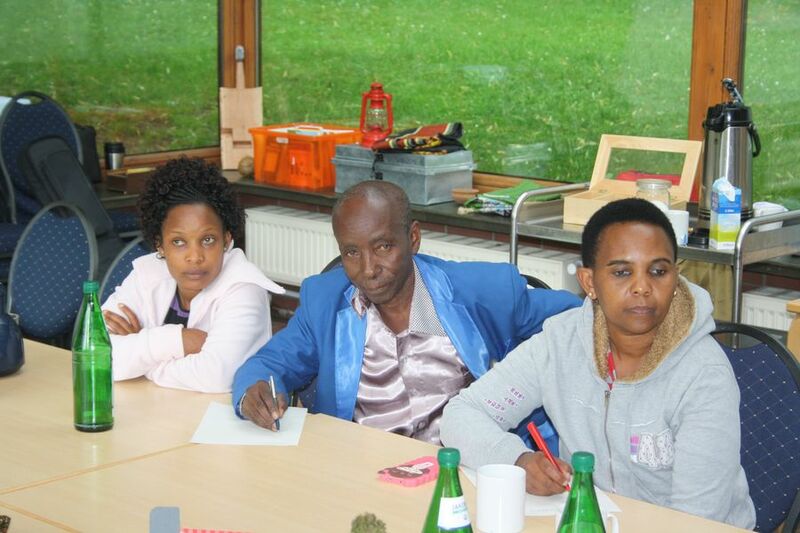 The preparation workshop in Kellinghusen was led by Marcus Wack, Upendo Towo and Pracseda Towo. Laura Schneider, Carolina Paar and Charlotte Masekowsky, who are former volunteers, also took part at the workshop and could give useful tips because of their experience from their own volunteer service. 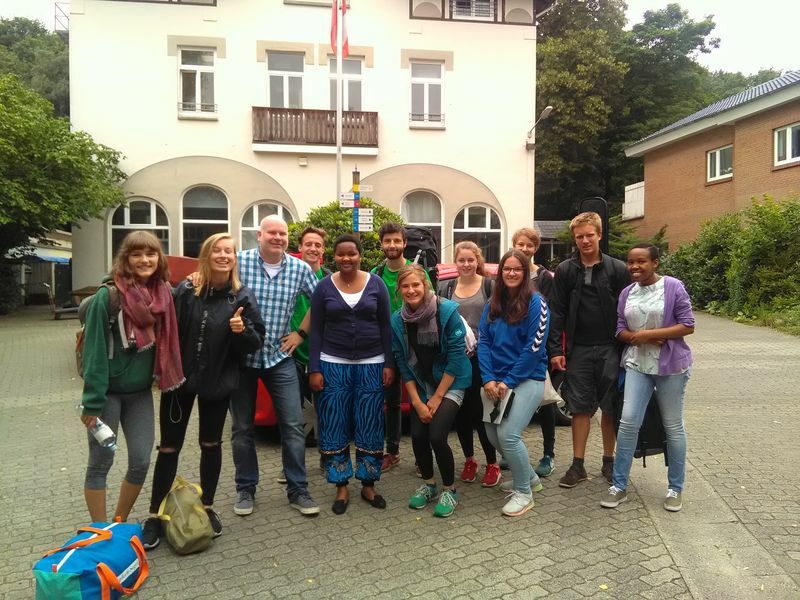 On September the second the volunteers start from the Helmut Schmidt Airport in Hamburg to the Julius Neyerere Airport in Daressalam, where they will be picked up by a bus which takes them to the Kilimandscharo in Uuwo. 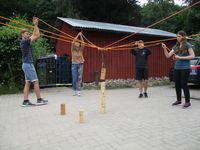 WELTWÄRTS-mid-term seminar "All across Africa"
Now, after half of the voluntary service has past by, the eight volunteers from the associations RAFIKI and ELIMU had to take up a very special challenge. 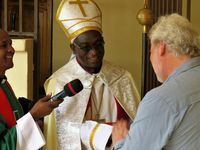 Conducted by Gilbert Towo and Marcus Wack the mid-term seminar took them all across Africa, from the Indian to the Atlantic Ocean. 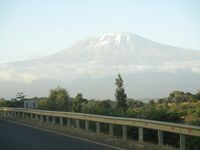 Starting at their home village Uuwo at mount Kilimanjaro it went by bus to Daressalam via Bagamoyo. 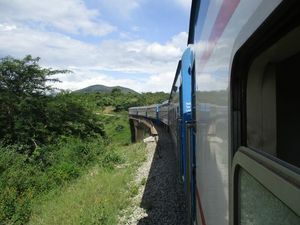 From there they continued by train and took the Tanzania-Zambia Railway to the 1850 km away town Kapiri Mposhi and then by bus to Lusaka, the capital of Zambia that happens to be the first stop. Two days the volunteers were able to absorb the differences between Zambia and their "native country" Tanzania. 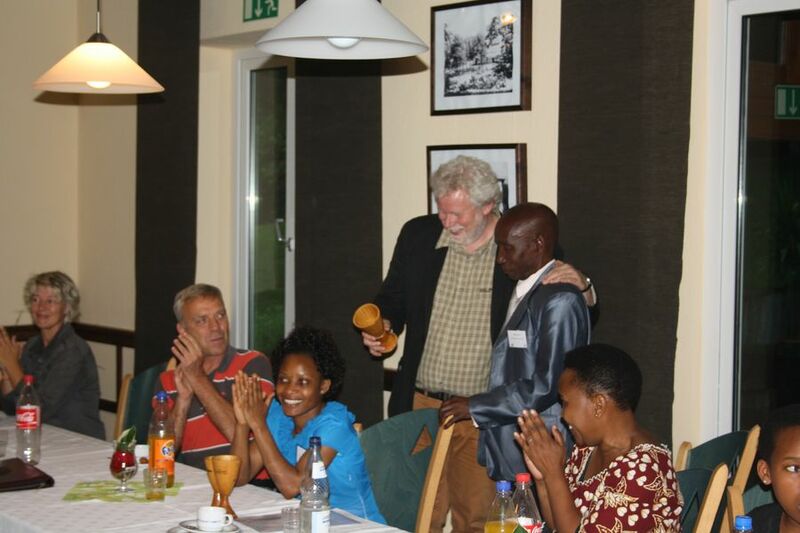 Subsequently the Zambia Railway took them to their next leg, the 600 km away town Livingstone. Besides numerous conversations on the work in the schools and youth projects the average speed of 20 km/h made it possible to enjoy an outstanding view of the countryside. 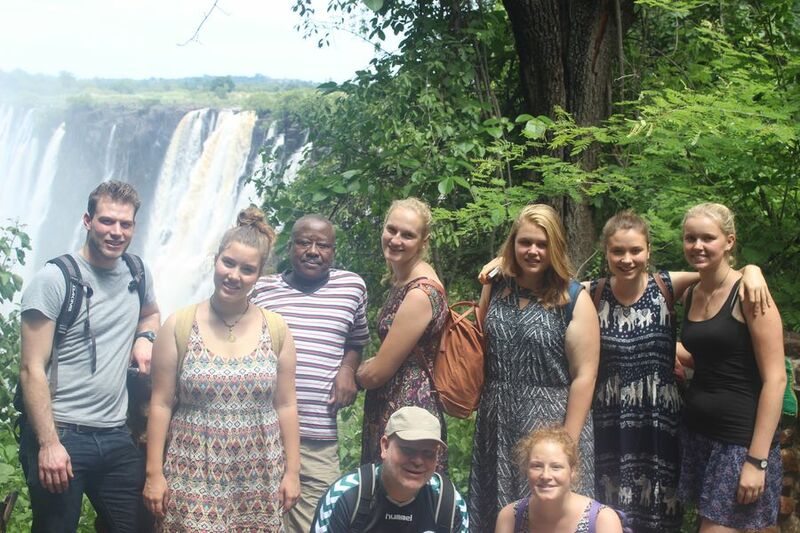 One big highlight of the journey was in Livingstone the visit of the UNESCO world heritage, the Victoria Falls. 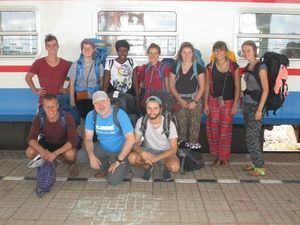 Visits at the railway museum, the Livingstone museum as well as the jewish museum provided us diverse insights in history and stories of southern Africa. The following 1500 km by bus to Windhuk, the capital of Namibia, have propably been the most exhausting and partly most exciting of the whole journey. The bus brake down at the most extensive and uninhabited places and just before we got to Windhuk it completely gave up the ghost. 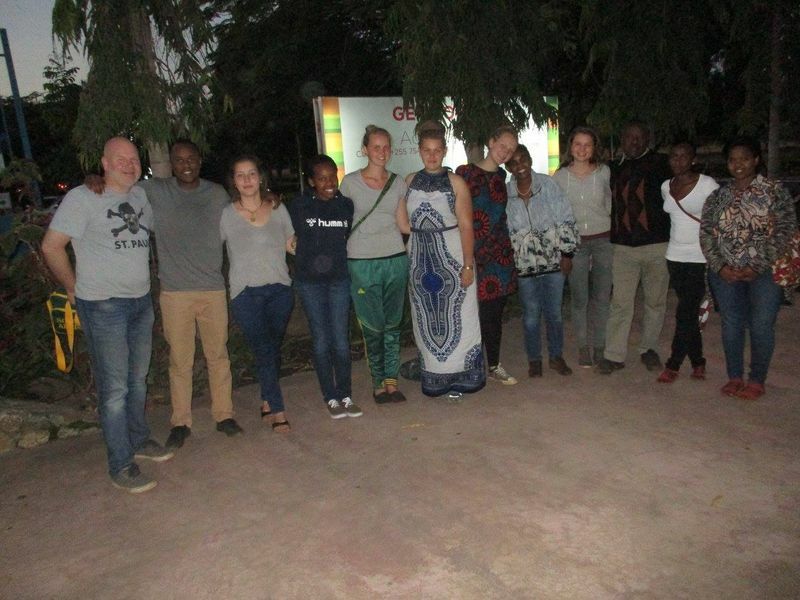 At the end the tour delayed up to 30 hours, but after all it gave a nice opportunity to meet numerous interesting people from the Congo, from Simbabwe, Sambia and Namibia. 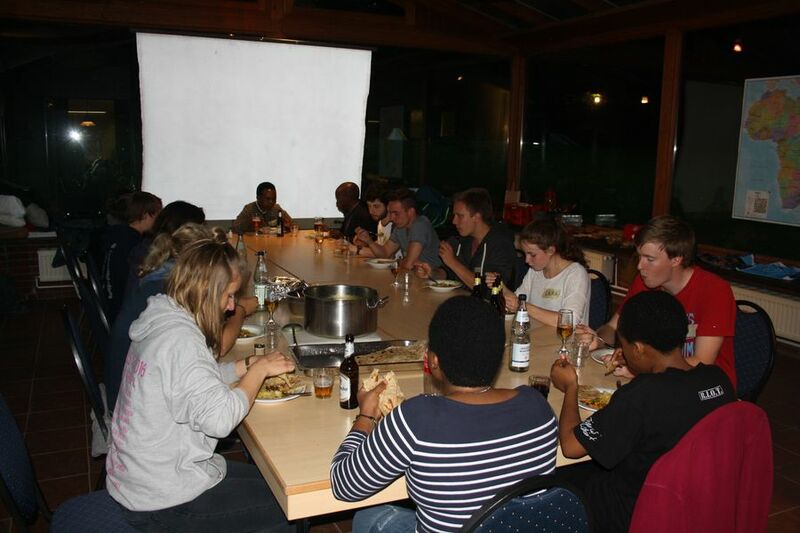 Comparatively relaxed were the 500 km to Swakopmund. There it was pretty exciting to experience the "german" Africa, a city near the Atlantic Ocean where you can obviosly recognize the still excisting german influences. By arriving at the beach of Swakop our joint travel destination was achieved: "All across Africa - From Daressalam to Swakopmund". 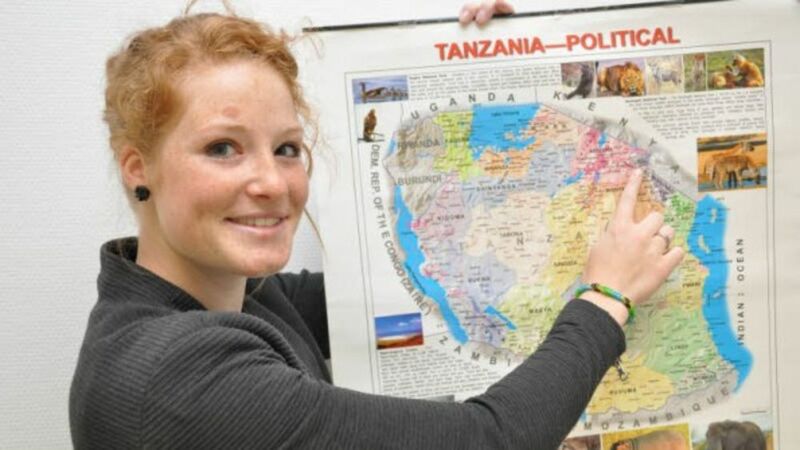 Furthermore, with the support of the tanzanian mentor Upendo Towo, the fellow traveller Annika Butzke, the host father Gilbert Towo and the german mentor Marcus Wack, new ideas for the remaining five months at the different deployment sites at Kilimanjaro were formed. 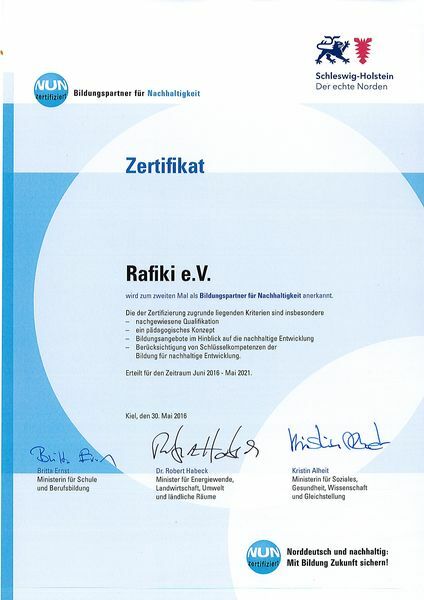 For RAFIKI e.V. did participate Nell Weiße, Elisabeth Siegel, Laura Brunkert and Jule Schmidt, for ELIMU e.V. 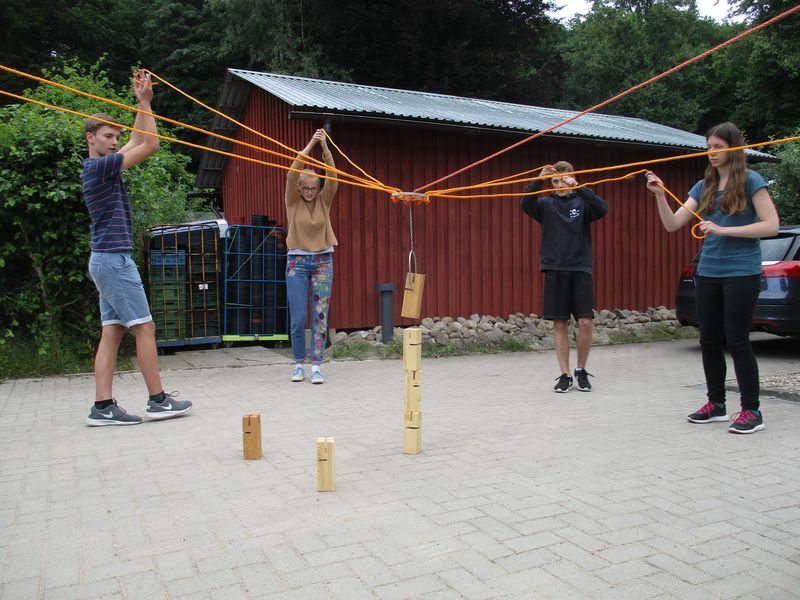 Carlotta Schlusen, Tyll Röhrig, Noah Willmann and Paul Neumann. 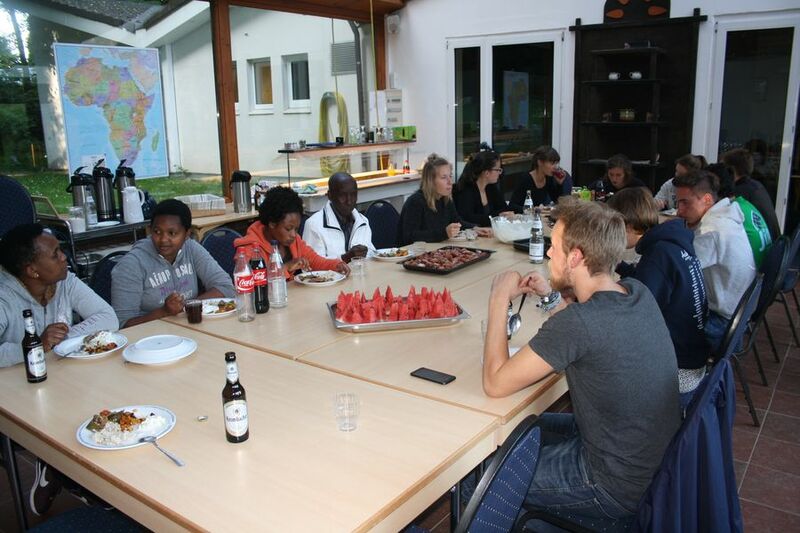 At our partnership school, the "Gemeinschaftsschule am Himmelsbarg" in Moorrege, projects all about Tanzania took place. 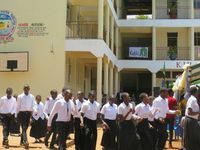 Within them their pupils made up questions about tanzanian culture and our students from KIUMAKO answered them. Here you can see what they think about their culture. Voluntary work - who is actually helping who? 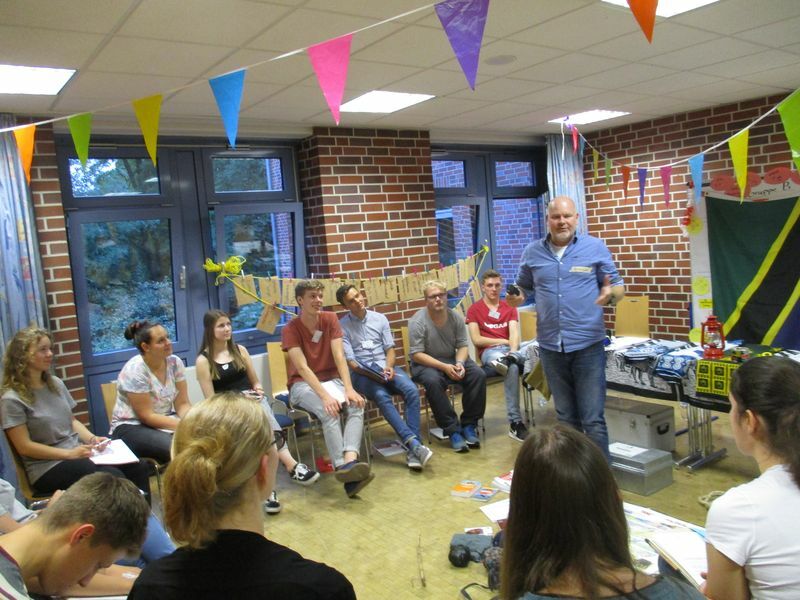 Here you can see one of our volunteers in an interview, from the Schleswig-Holstein Journal from 17/09/2016. 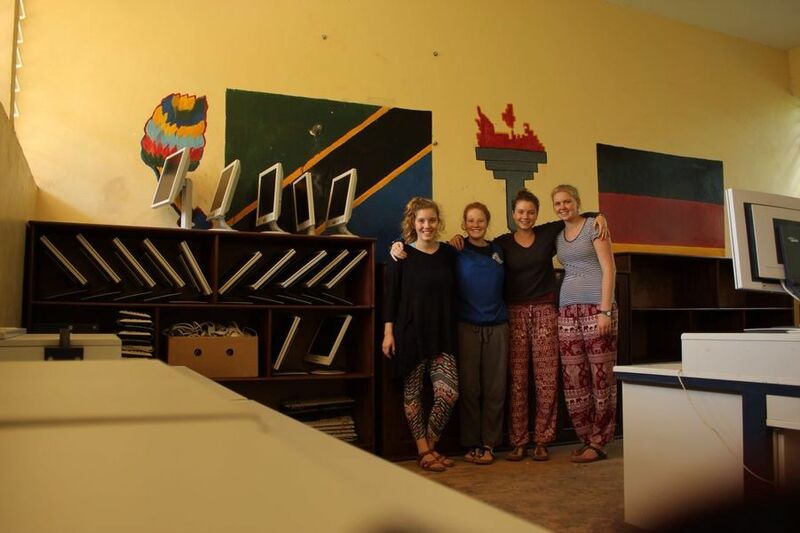 Laura (Eckernförde), Laura (Kellinghusen), Elisabeth (Frankfurt), Nell (Bönningstedt) und Jule (Sylt) form our new volunteer team at KIUMAKO Secondary School in Uuwo. 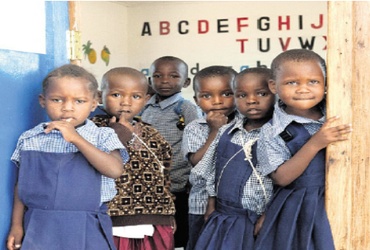 Four of them are going to spend twelve months at KIUMAKO as well as in the surrounding area to provide youth and educational work. 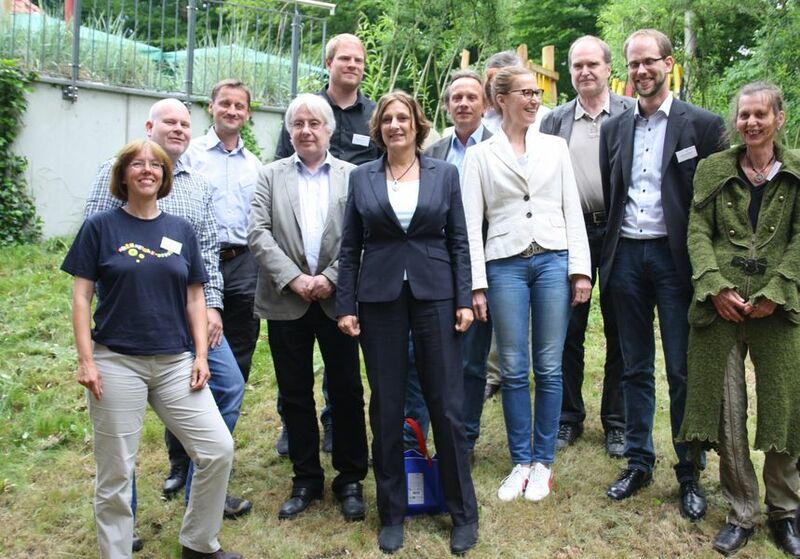 Laura Schneider from Kellinghusen for example is going to get active especially in sport projects. 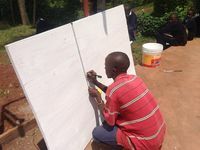 Marcus acts as a mentor and coach for the volunteers, he already prepared them and gave on-site instructions. 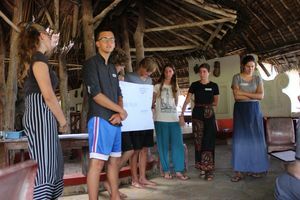 Tomorrow starts a six-week swahili-course for the volunteers before they get started with all their energies with the numerous projects. 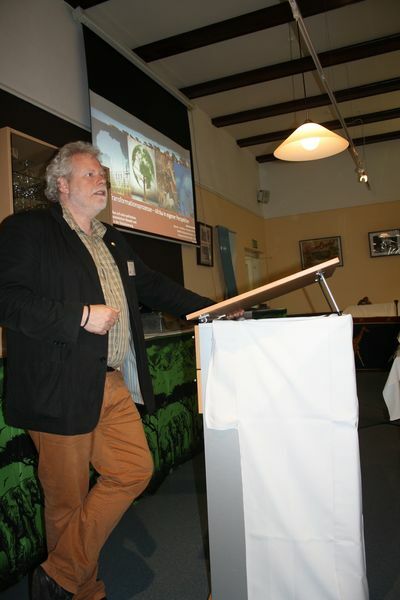 Here a short article by a volunteer from Bönningstedt from the magazine Dorf-Geflüster. 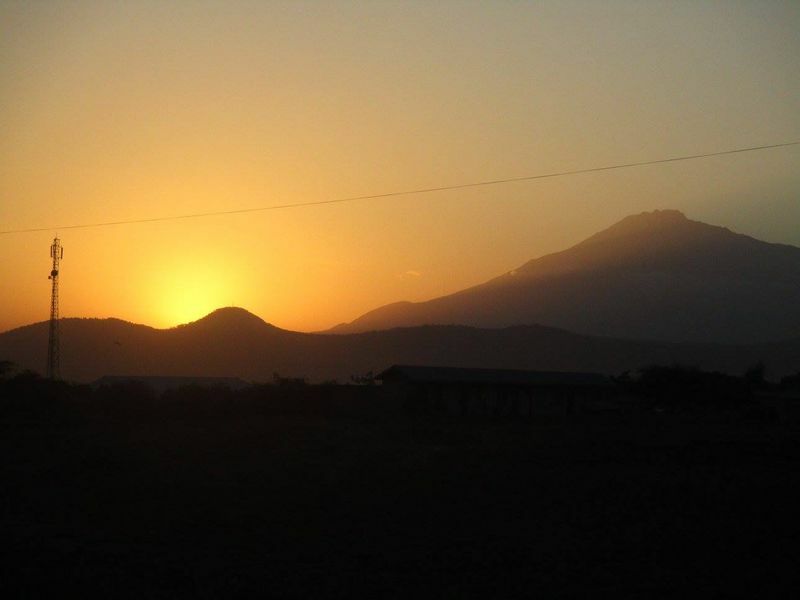 One year in Uuwo/ Tanzania has come to an end with marvellous views. As a farewell to the volunteers of 2015/16 mount Kilimanjaro as well as Meru presented their best sides and accompanied the way to the airport very well. 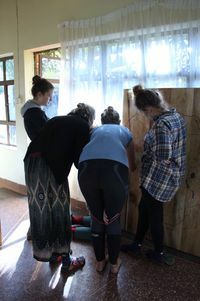 Six wonderful girls who left their marks inter alia at KIUMAKO will be remembered! 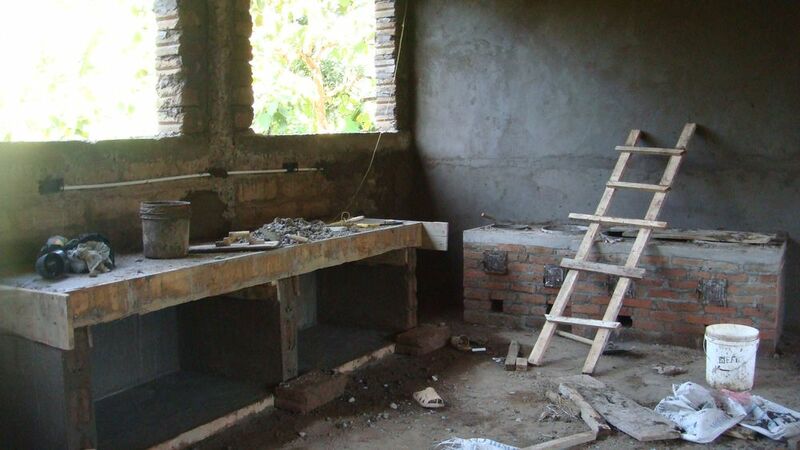 We are about to finish our kitchen project. Now the building is done. 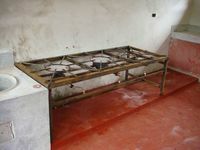 An energy saving stove and another one with gas have been manufactured. 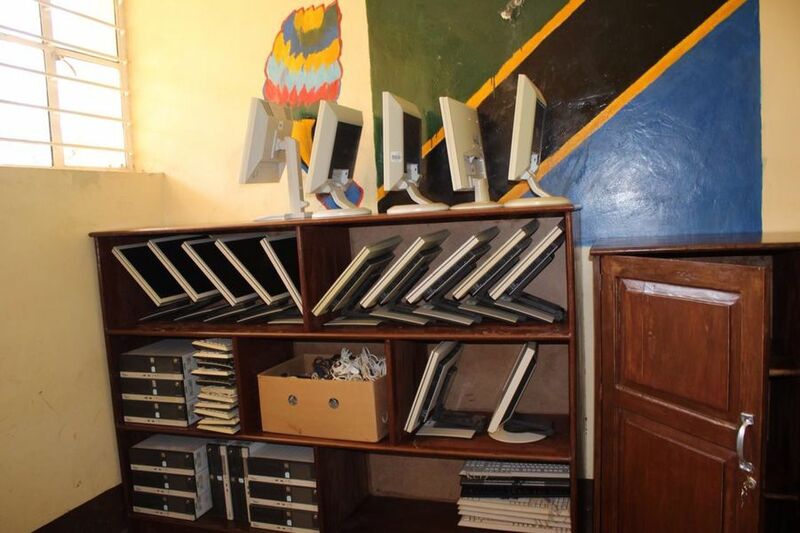 The volunteers organized some shelves for our computers at the KIUMAKO Secondary School. So now we can keep the computers in a good order. 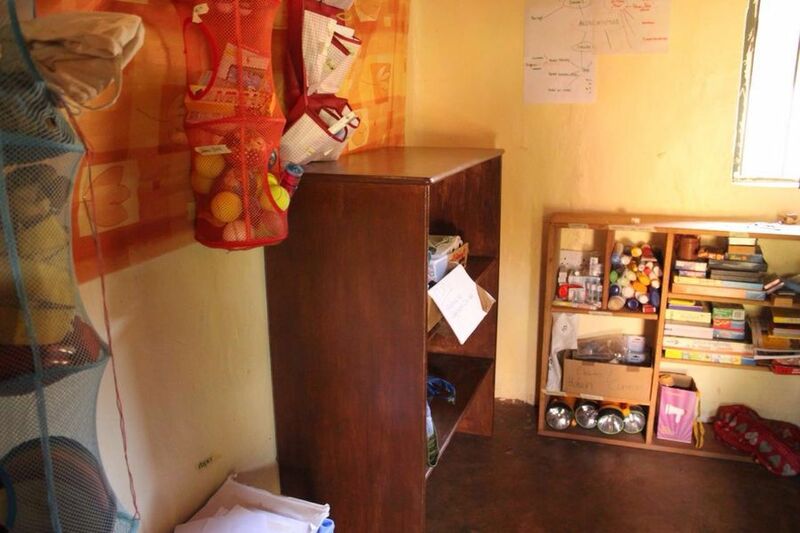 Also some other shelves in the office of the volunteers have been arranged. 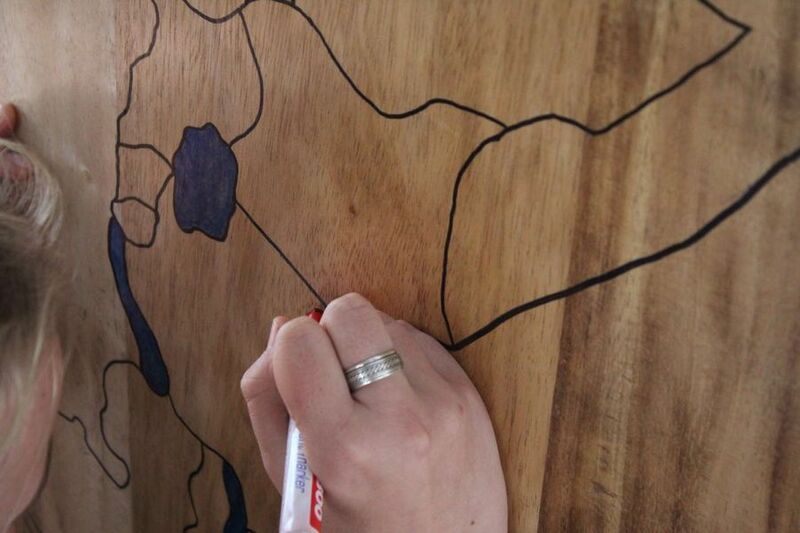 Some art too, like a drawing of the African map on a wooden plate. 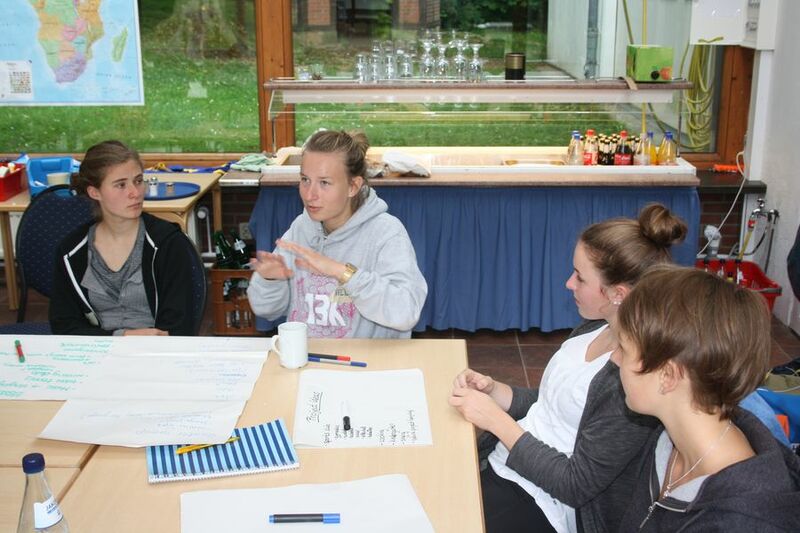 This year we already managed to prepare our new volunteers at the youth hostel of BiBeKu in Kellinghusen. This was a seminar for three days. 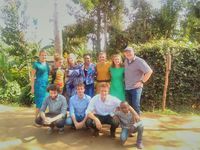 There were total of eight volunteers that will go to Tanzania for one year. 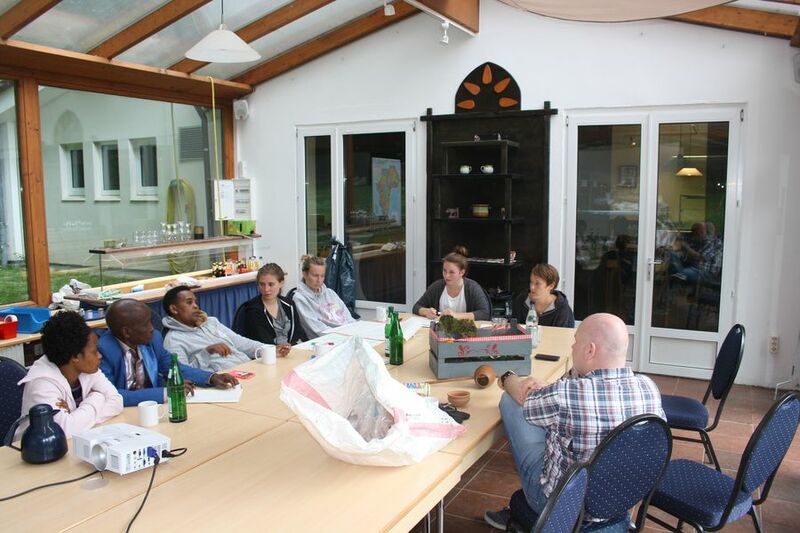 The seminar was conducted by the mentor of the volunteers Marcus Wack joined by the guests from KIUMAKO secondary school: William Lyimo, Pracseda Towo and Rehema Msella, some of the older volunteers: Lea Fiedler, Simon Dickmann, Lisa Schreiber, Eike Steinke and Lisa Eike and also the volunteers from Tanzania here in Germany: Mercy Lyimo and Nancy Towo. This was such a great time together. 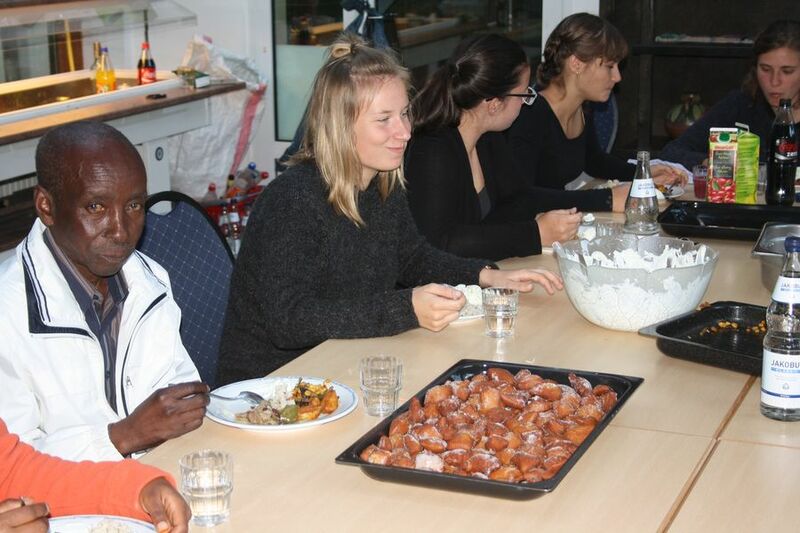 We cooked Tanzanian food and talked about all the projects, that the volunteers will do. 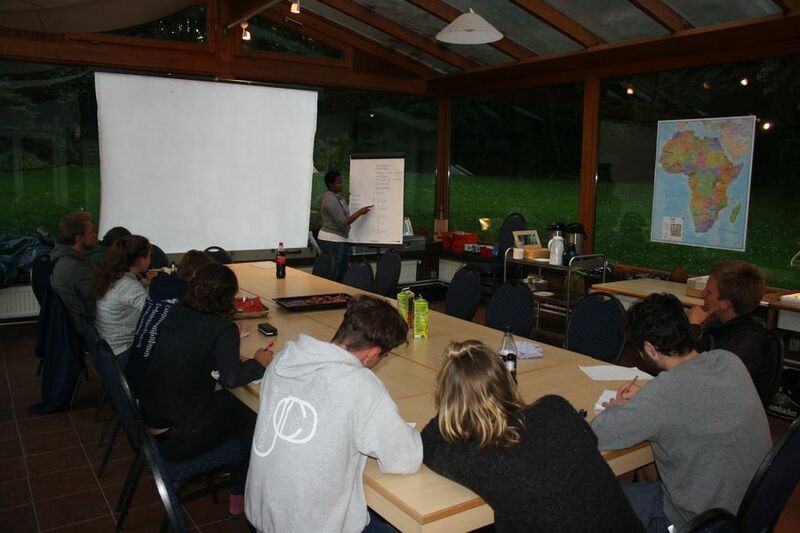 We also offered them a quick Swahili course done by Mercy Lyimo. It ended with a selfie together. WE WISH YOU A SUCCESFUL YEAR! 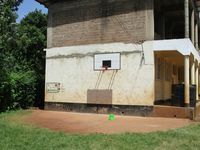 Sport activates, gives motivation and energy, brings fun ... That is what we want to do with our students at KIUMAKO. 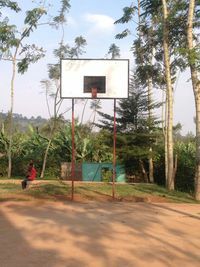 Some pictures of projects from the volunteers that make this possible. 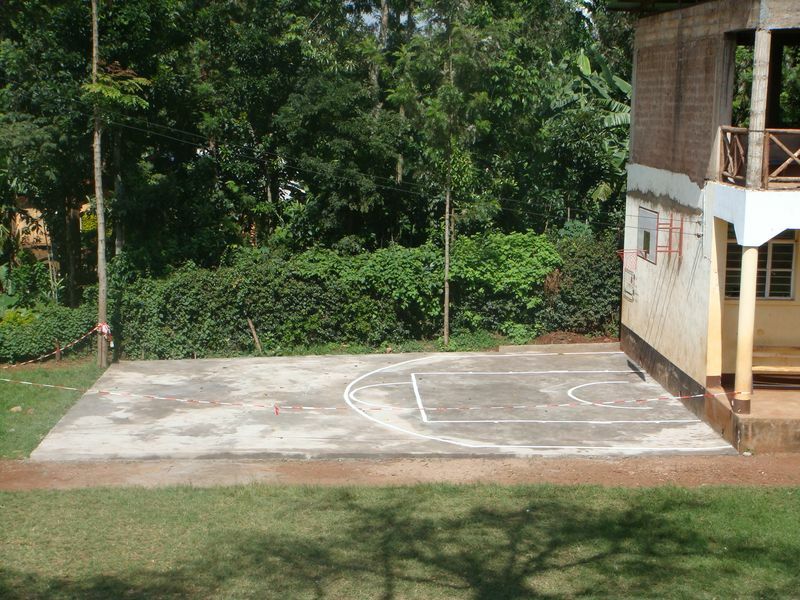 For example now we have a perfect basketball field and also table-tennis. 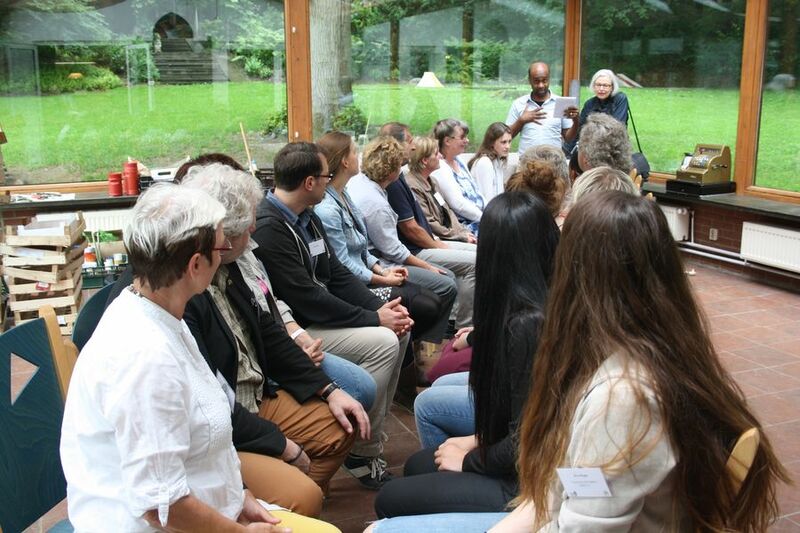 This year at the RAFIKI network meeting, which took place in the conference room of BiBeKu in Kellinghusen, nearly 30 people from different organisations were present. 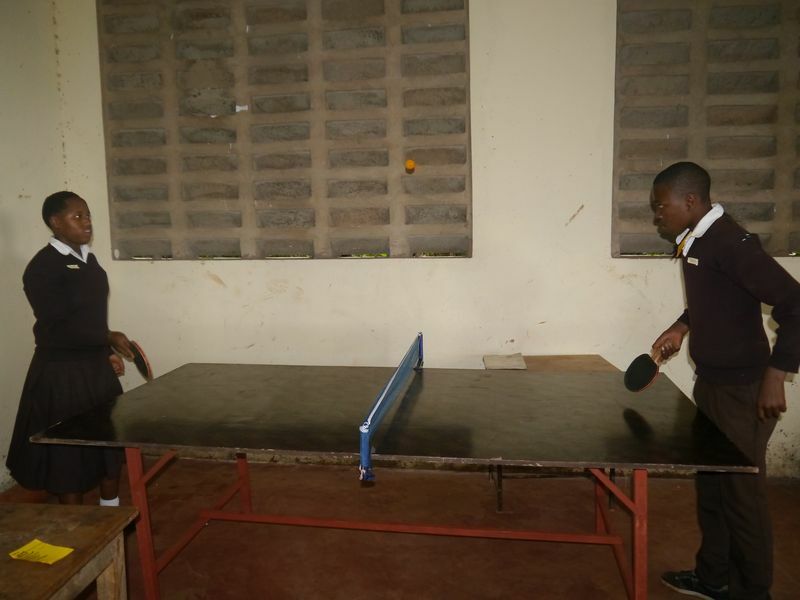 From the KIUMAKO Secondary School in Uuwo, where RAFIKI is supporting the building since more than 6 years, there was Rehema Msella, Pracseda Towo und William Lyimo. 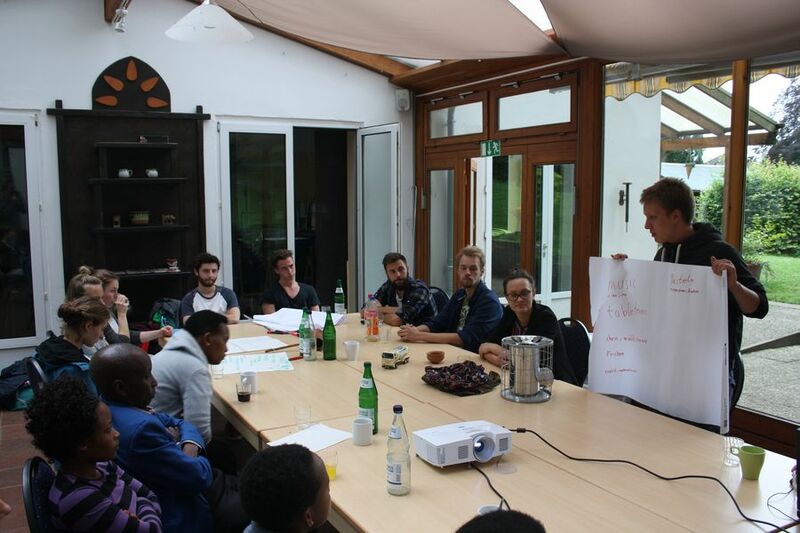 While Oliver Zantow explained about the current situations at the KIUMAKO school, Marcus Wack informed about the works of the volunteers from Germany at Tanzania as well as the volunteers from Tanzania at Germany. Now Nancy Towo and Mercy Lymo are the first volunteers doing a south-north exchange through the weltwärts program in Kellinghusen. Rahime Diallo from the Organisation DIASPORA Policy Institute lectured about Post colonialism and led a lively discussion. At the end of the meeting all guests were invited to Pilau, maandazi, vegetables and chapati, tanzanian specials that were prepared by BIBEKU-chef Thomas Jöckel together with Pracseda Towo, Rehema Msella, Waqas Maqbool, Mercy Lymo and Nancy Towo. "We don’t want to protect the environment, we want to create a world where the environment does not need to be protected!" This starts with the young generation. 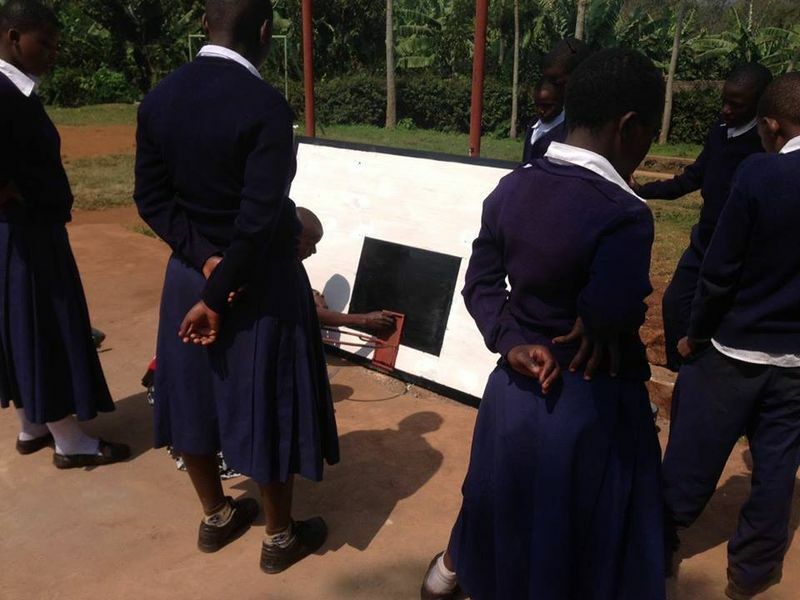 Our volunteers and the KIUMAKO students work together for this at the "Mazingira club" - the Environment-Club of KIUMAKO. On 30 May 2016 RAFIKI received for the second time the NUN(Norddeutsch Und Nachhaltig ) certificate of Schleswig-Holstein for its work of education for sustainable development. 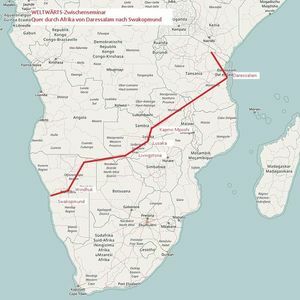 RAFIKI works in a chain way and makes impacts. 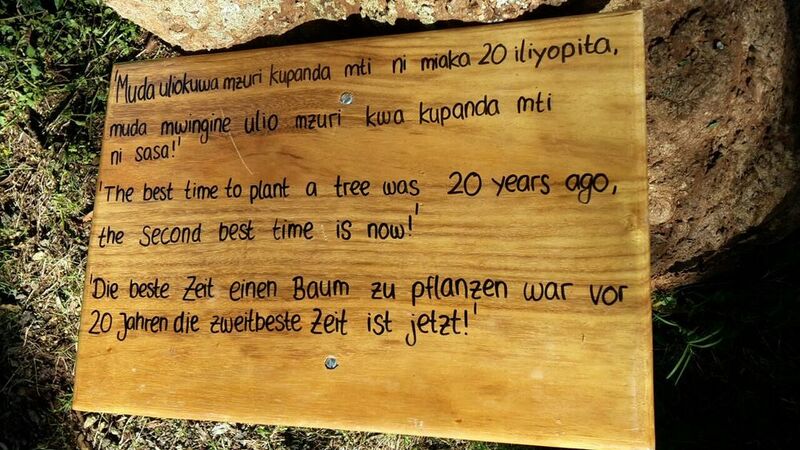 It works with both Tanzanian and German youth. 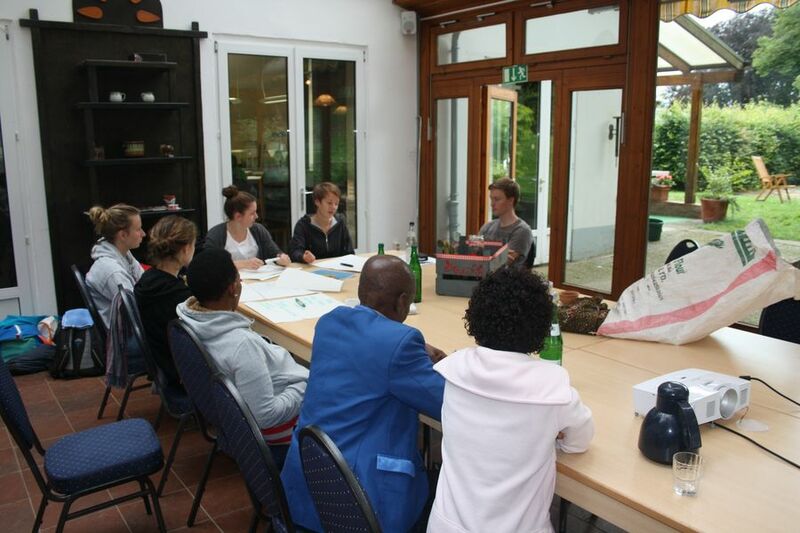 Where the German youth can learn and then share with the Tanzanians. 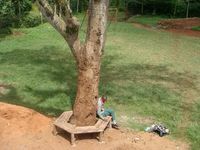 In this way they make all of them sensitive to their environment. 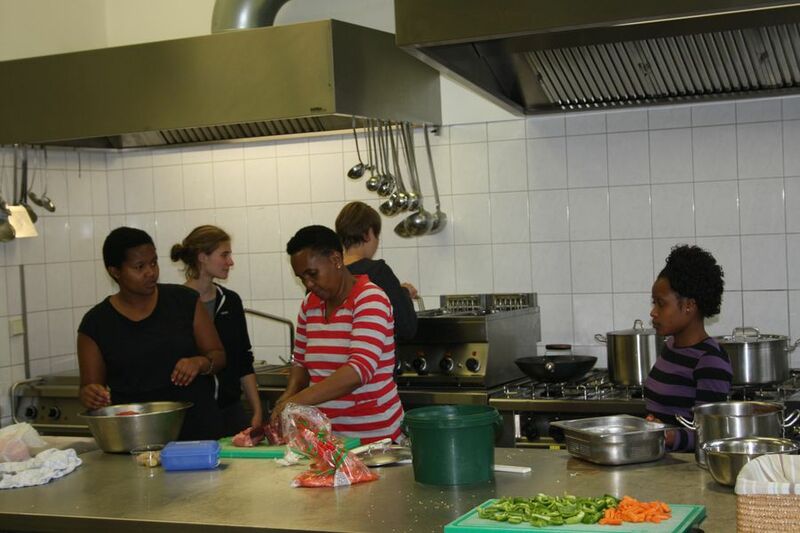 The action in the kitchen goes on. 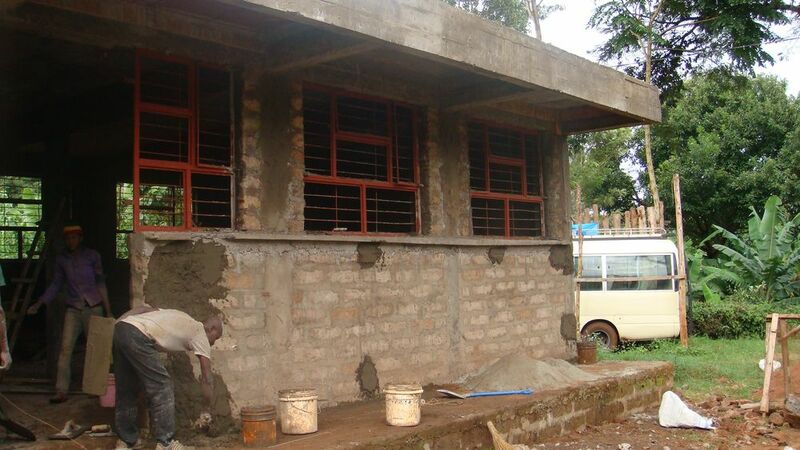 They already applied the concrete layer outside the kitchen wall and some parts inside. 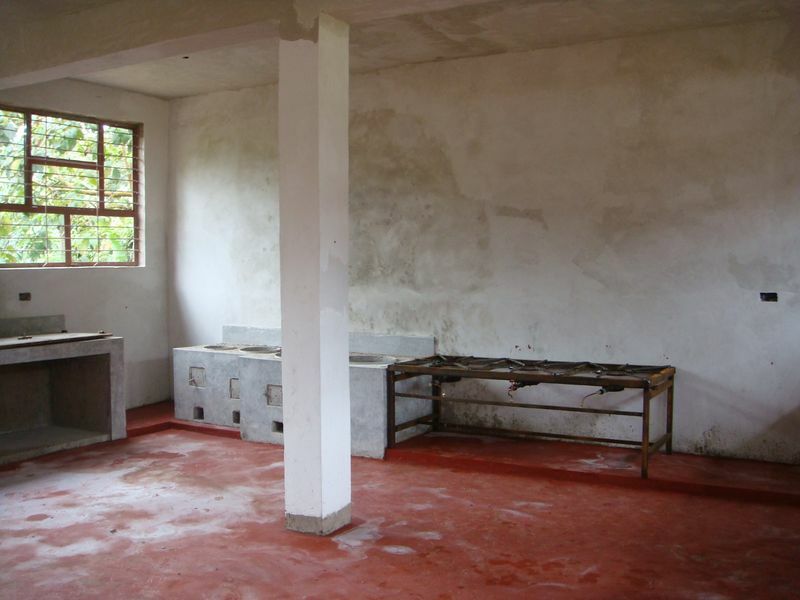 The sinks and the preparation place are also on progress. 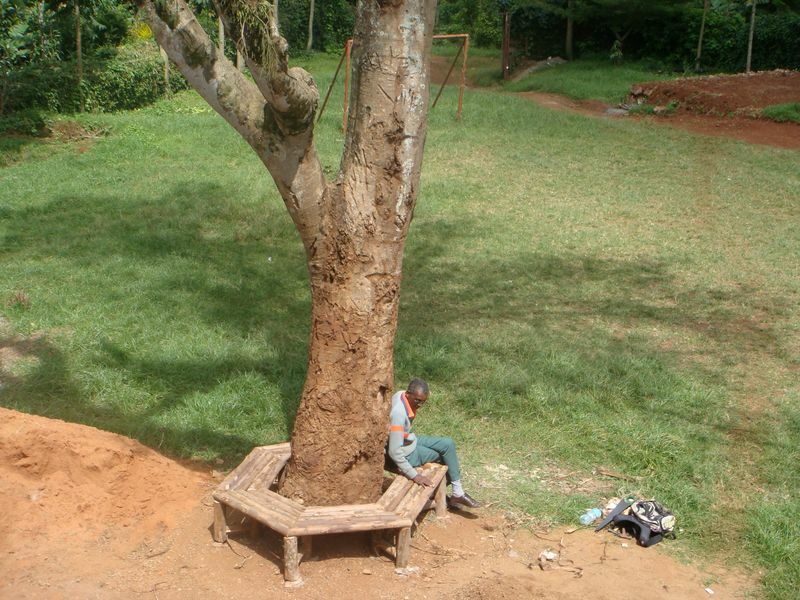 Our volunteer Lars had the idea to build a sitting place under a tree. 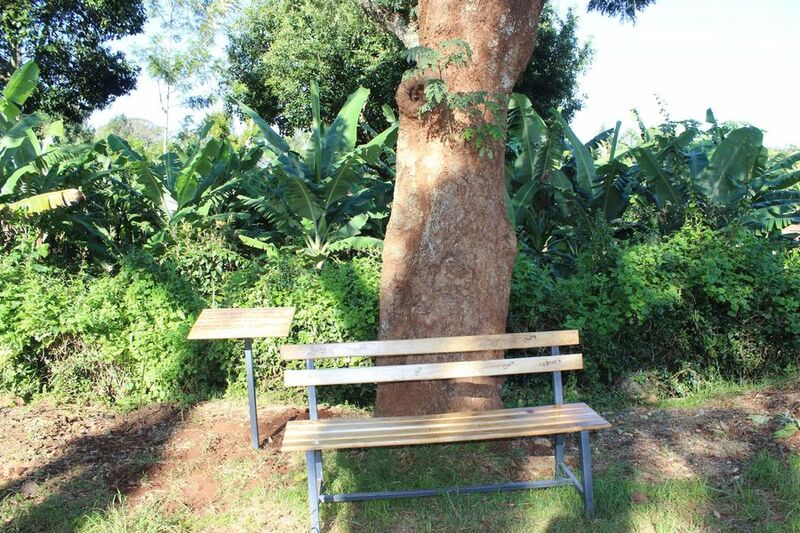 As you can see in the picture the students of KIUMAKO will be able to sit outside. 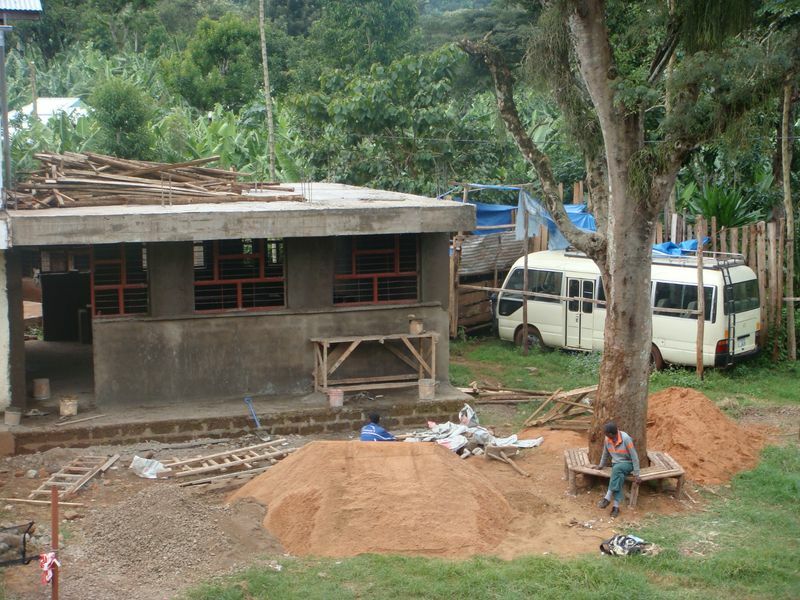 Last week the working progress in the KIUMAKO kitchen kept on going. The people are still working on it to make sure that they finish. 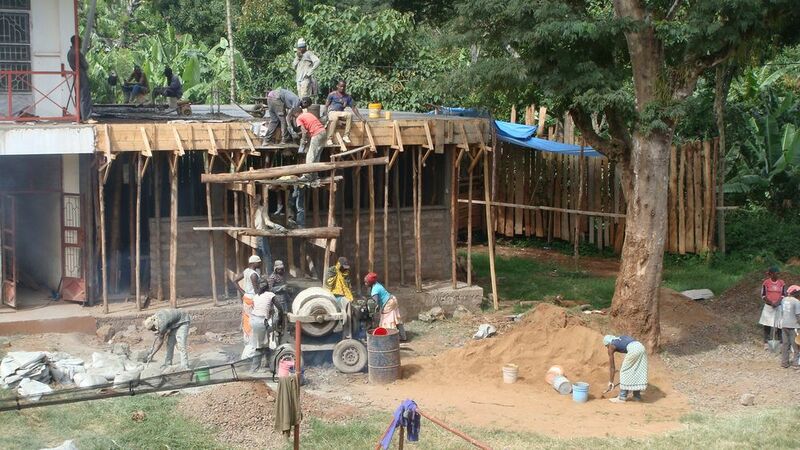 The concrete for the energy saver cooker is already there. 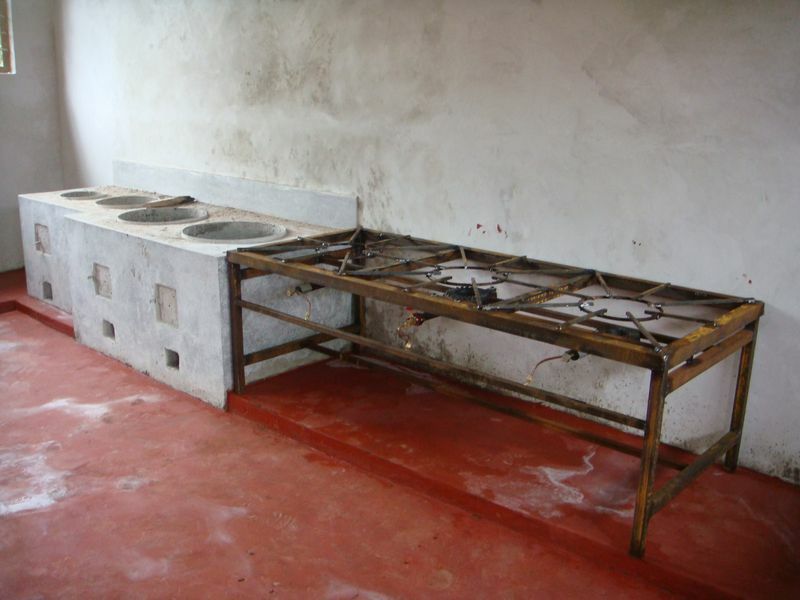 It has four cooking places. 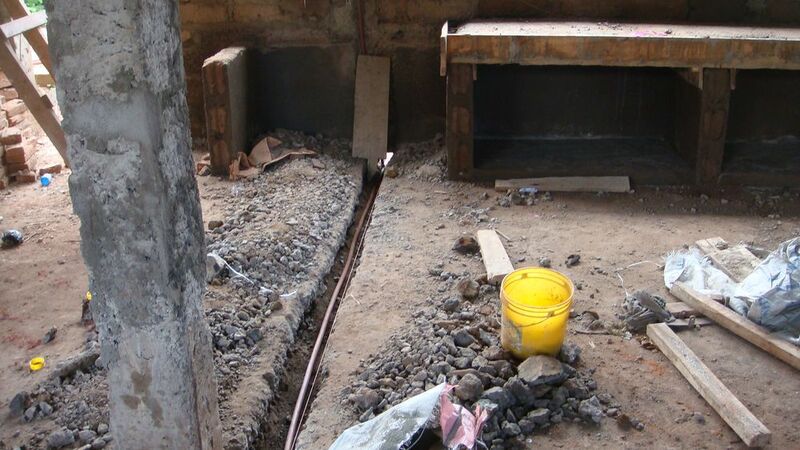 The pipes are installed in the floor and the walls. 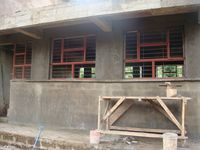 The place to put the windows is also ready. 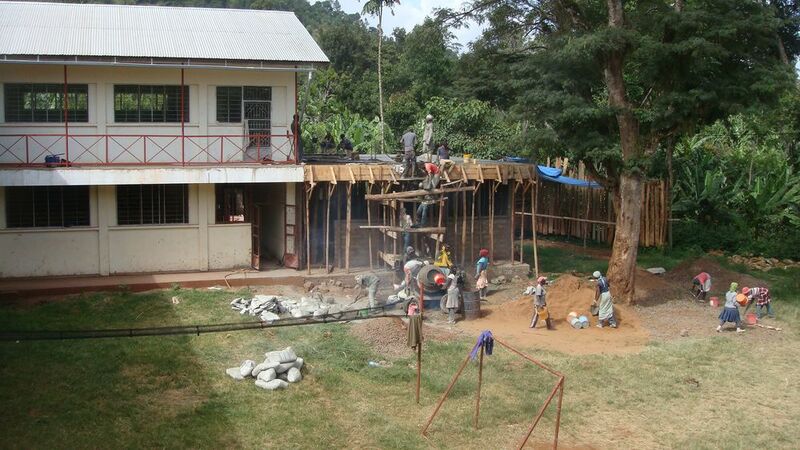 And that’s how our kitchen building looks right now. 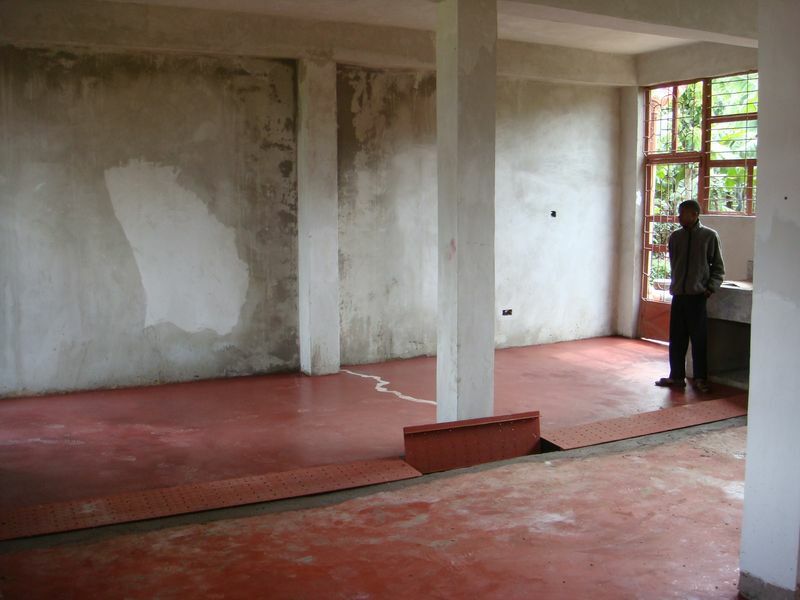 The complision of the building will create the possibility for new teaching approach. 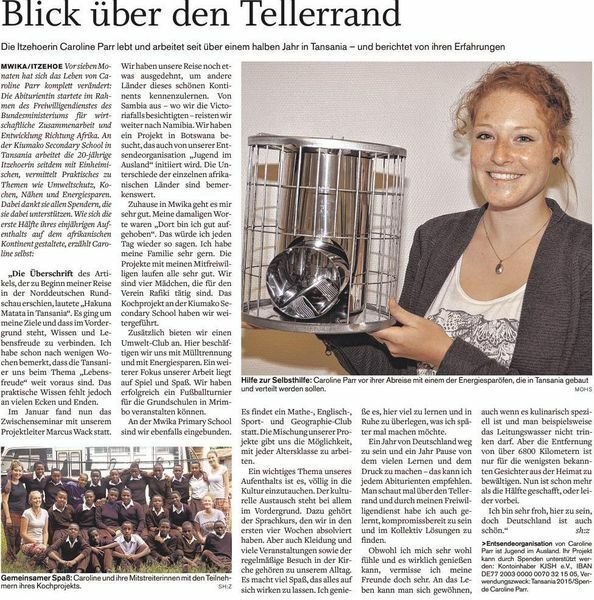 "Today there is an article about our volunteery work story in Germany." 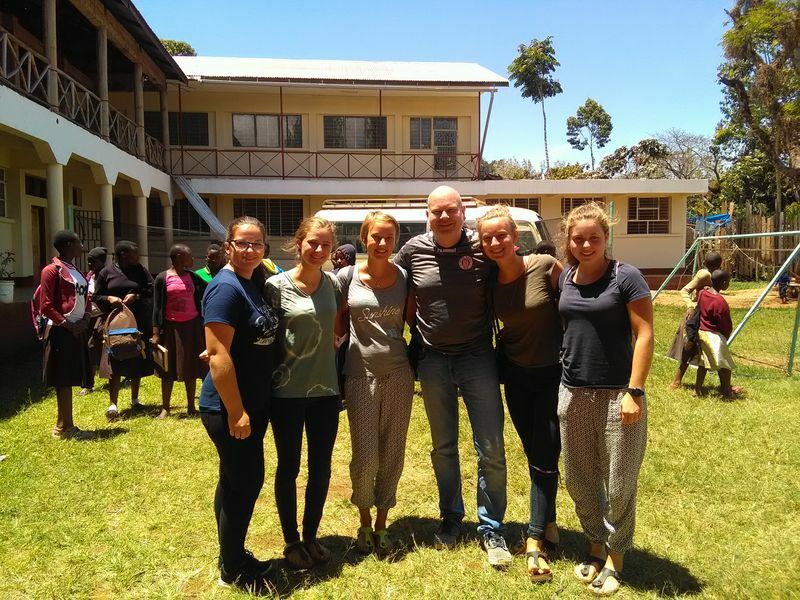 After graduating in Mechanical Engineering, Lars Dehmel from Kiel is completing a three-monthly voluntary service for RAFIKI. As a technician he especially supports the building of the KIUMAKO Secondary School. 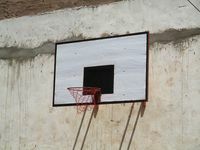 His first project was to continue the construction of the sports facilities. I.a. 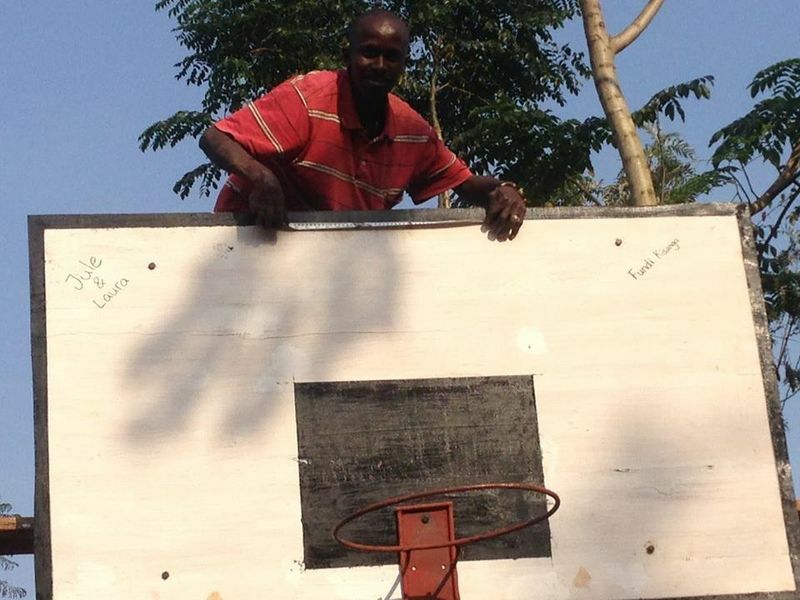 the passionate basketball player built and firmly installed a professional basketball basket. 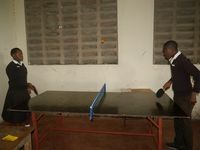 Furthermore he and his tansanian colleagues have built a table tennis table together, which is propably the first table in the whole region. 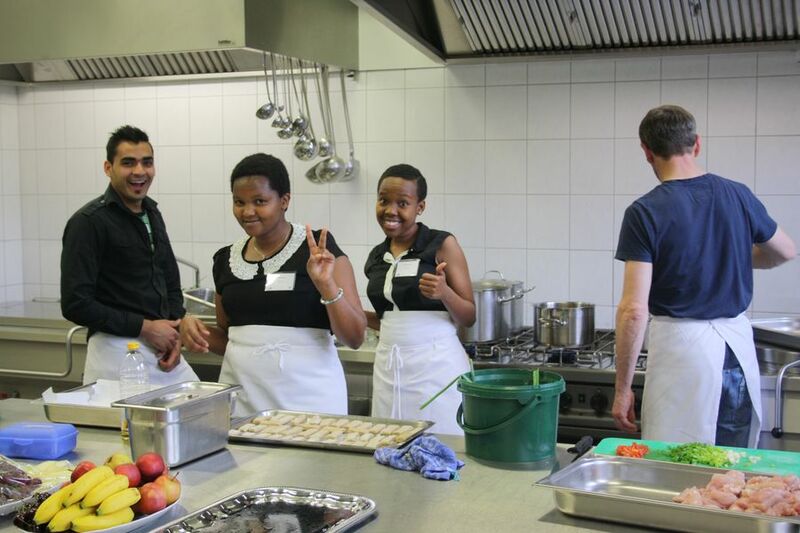 The education at KIUMAKO is continuing tomorrow and and will take place at the Dining-Hall. 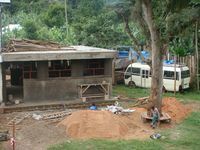 The kitchen building got a roof. 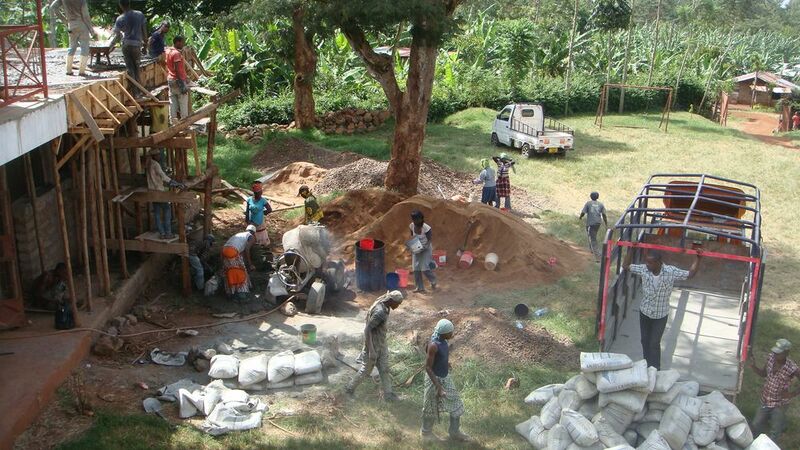 A company from Arusha has arrived with twenty employees last week to pour a concrete ceiling. It took one working day till the concrete ceiling, which can bear a second floor, was finished. 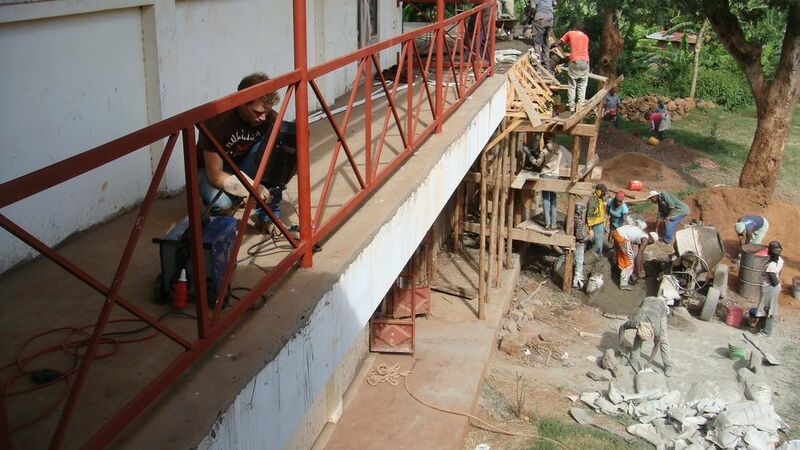 Lars Dehmel, our man on site, has observed the construction process and performed some small repairs. 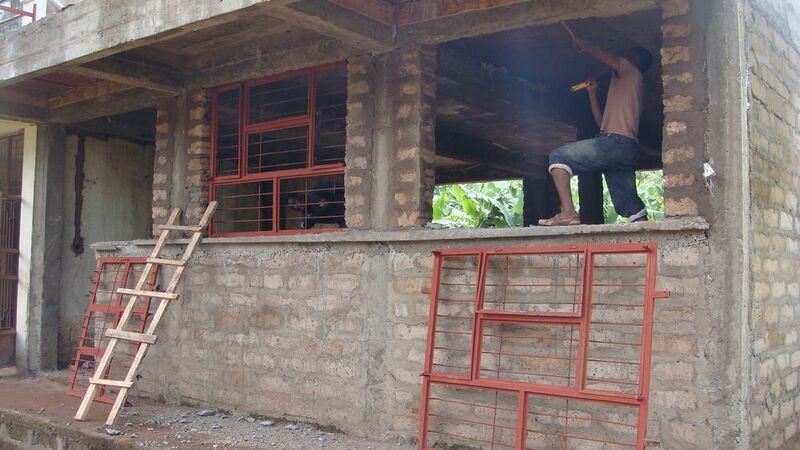 This also included the welding of the fence at the first floor. Caroline Parr from Itzehoe reports on her first six months as a volunteer at the KIUMAKO Secondary School at Uuvo. From 21 to 30 January the big midterm seminar of the RAFIKI volunteers took place. 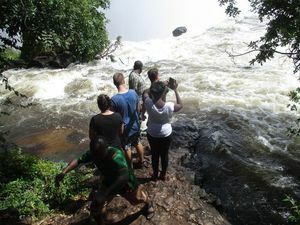 Conducted by Marcus Wack and Gilbert Towo they started in Daressalam and travelled right through Tansania and Sambia as far as Livingstone and the Victoria Falls. Everything they've learned and experienced during their journey you can look up at their blogs. 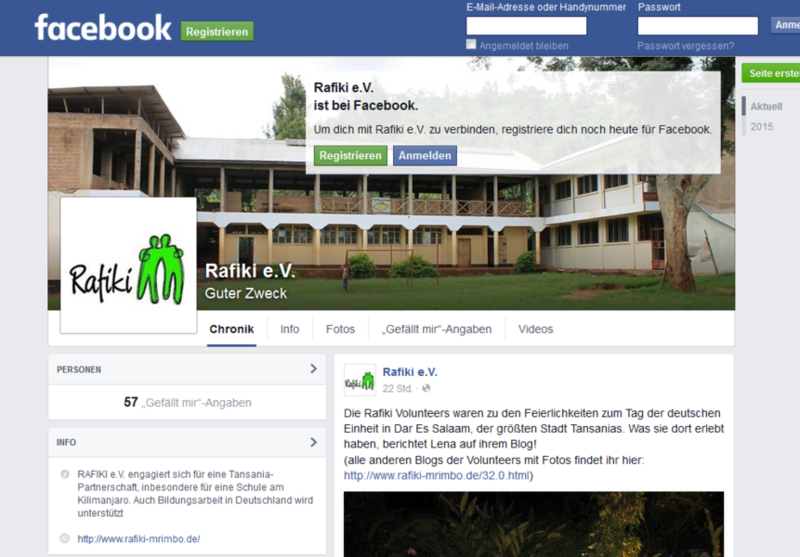 RAFIKI is now on facebook! You can look up news and current developements on our page. We look forward to your like and hope for a good interaction with all interested persons! Here you can visit our page. 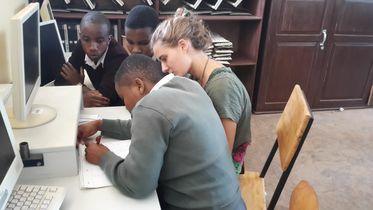 Fire for Africa: Caroline Parr from Itzehoe is volunteering at the Kiumako Secondary School for knowledge and joie de vivre. Just a few weeks ago she was still at school. From September, Caroline Parr (20) will teach children in Tanzania practical knowledge and zest for life. 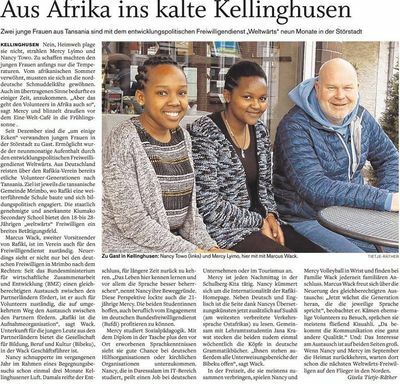 The Itzehoer graduate student goes to Africa as part of the voluntary service of the Federal Ministry for Economic Cooperation and Development for twelve months - "weltwärts", as the ministry calls it. Her first contact with the "black continent" was two years ago - and after an adventurous vacation in South Africa she was immediately fascinated. As the question became more pressing as to what should happen after school, Caroline quickly decided: Travel would be great. 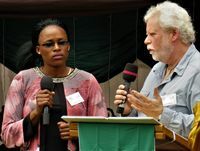 Getting to know africa better as well. She set the course for a combination of these two plans with the support of her football coach. 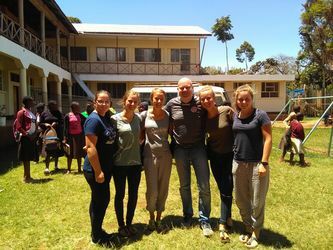 Marcus Wack not only looks after the ladies of VfL Kellinghusen, but is also deputy chairman of the association Rafiki, who initiated the construction of a secondary school in the community association Mrimbo in Tanzania. 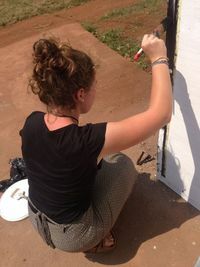 At the Kiumako Secondary School, young people between the ages of 18 and 28 are also being used in the Federal Volunteer Service: Caroline is already among the fourth "Volunteer" generation. 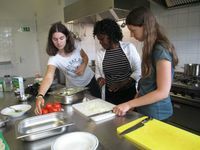 "Of course, we always look forward to being able to send young people from the region," says Marcus Wack, who is responsible for volunteer services. That would not be self-evident, because applicants from all over Germany must first go through a selection process. 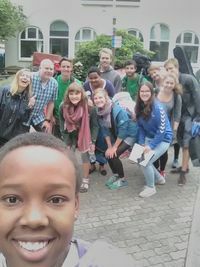 The competition is big, but Caroline has done it: She will start her service in September as one of four Rafiki volunteers, two more volunteers will be looked after by the Elimu club from Heikendorf. The six women between the ages of 18 and 22 will live in the small family guesthouse of Kiumako's administrative director Pracseda Towo. 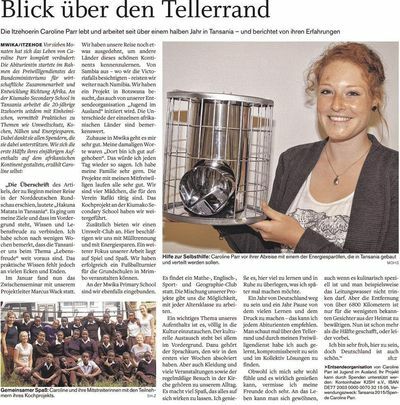 She was in Kellinghusen recently, and Caroline is convinced, "I'm in good hands." The young Itzehoerin is looking forward to their mission, but also expects homesick attacks. "However, because I have already met my guest mum and my host and the other volunteers, I'm not too worried." 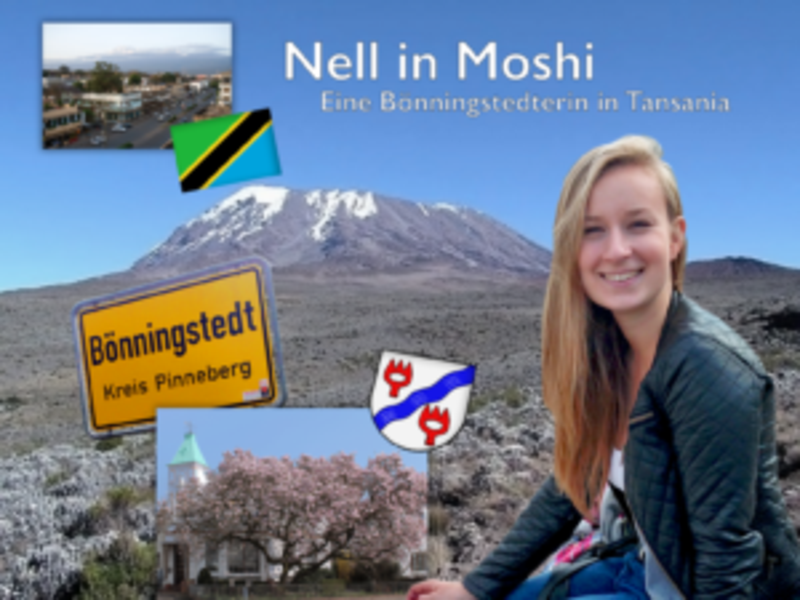 She already holds it with the life motto of many Tanzanians: "Hakuna Matata" - "Everything in order" , Especially since her parents are planning a visit. In addition, there is the Internet, which works much better thanks to a new mast for half a year, says Marcus Wack. "When you're in the right place, you can even skype." 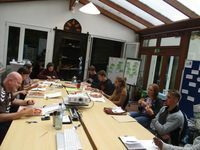 At the beginning there will be a four-week intensive language course. Because unlike in many other African countries one does not get far with English or French. 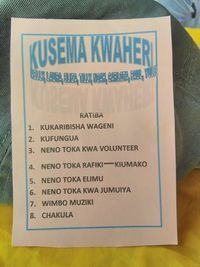 Wack: "Especially in rural areas you have bad cards without Kisuaheli." 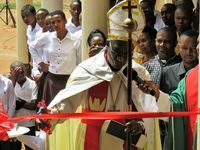 The more important is the language course, because: "The young people should learn a lot about the country and its culture." 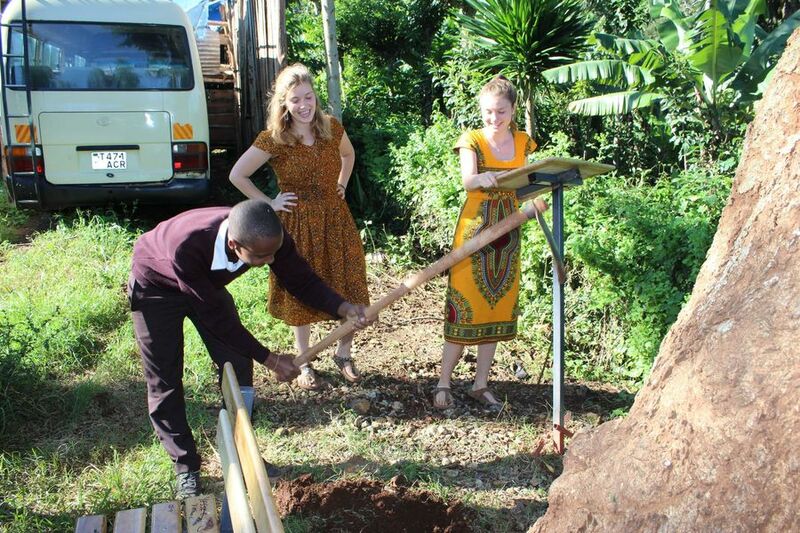 In return, the guests from Germany give the locals practical on the subject Waste separation or reforestation - this is how a tree is planted for each Kiumako student - cooking, sewing or saving energy. 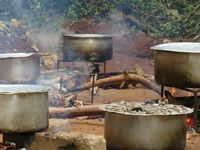 This time, a new type of stove is to be introduced, which requires only one sixth of the amount of wood used in conventional fireplaces. In addition, it is about giving joy of life, says Caroline. "We want to make life more beautiful with simple things." 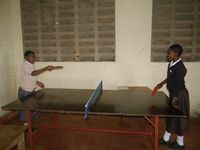 Therefore, also games, fun and sports are on the program - depending on the personal inclination of the volunteers. 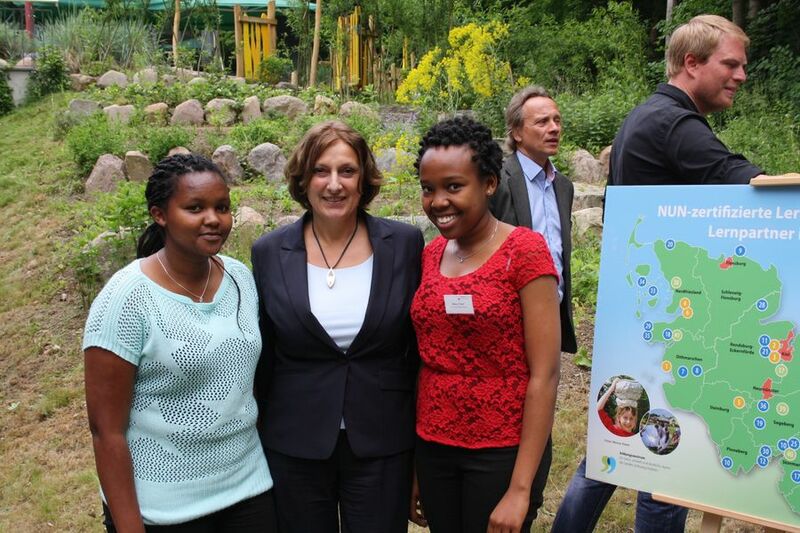 "The good thing is: Everyone can do something, but nobody has to," says the young Itzehoerin. That take the pressure. 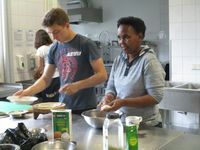 "For example, we know that even if we do not cook with them, they get something to eat at school." Caroline definitely wants to train football with the kids - especially with the girls. She also wants to get involved in the environmental group. 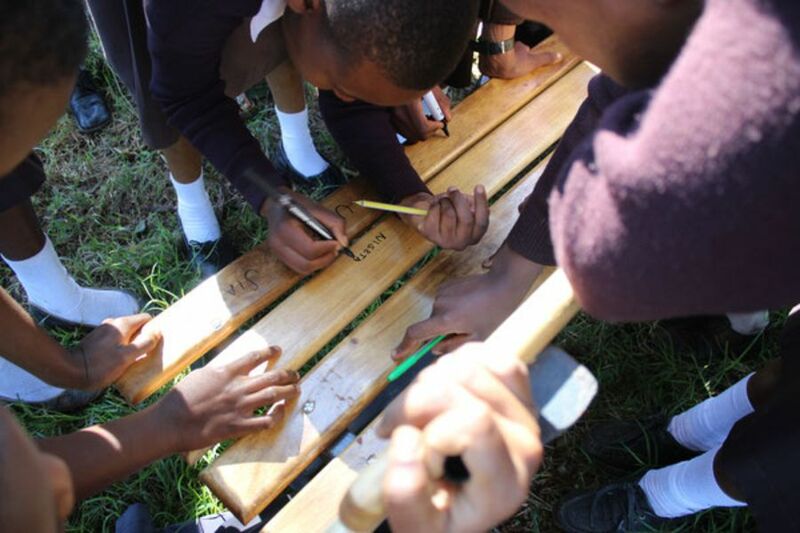 "Wood is very scarce there - everything that grows somehow gets chopped off immediately," reports Wack. If you start with this problem, so Caroline, everyone helped. Sending Organization of Caroline Parr is Youth Abroad, KJSH e.V .. her project can be supported by donations: Account Owner KJSH e.V., IBAN DE77 2003 0000 0070 3215 05, BIC HYVE DEMM 300, Intended Use: Tanzania 2015 / Donation Caroline Parr. 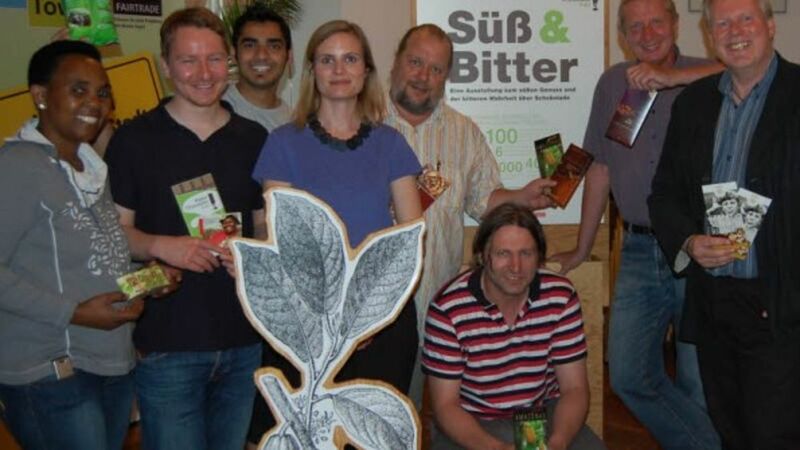 The Störstadt may continue to call itself Fairtrade Town (FTT). 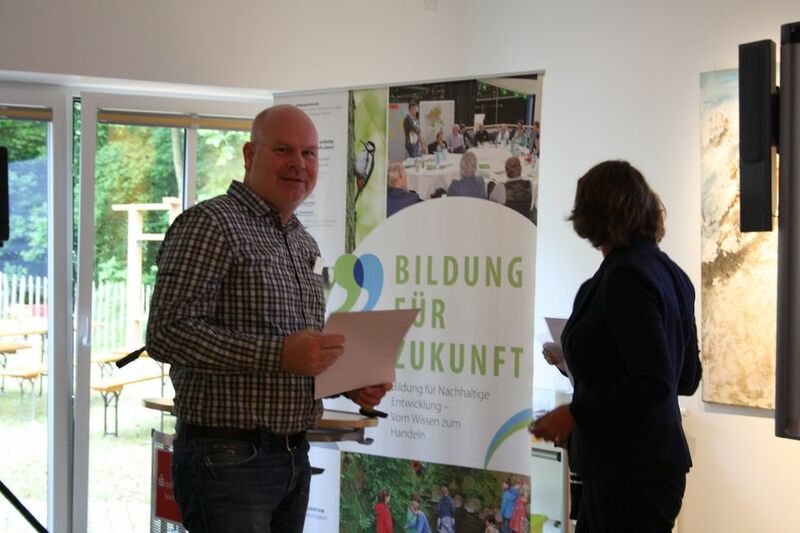 Reinhard Rübner (SPD) in the community center had cause for double joy. 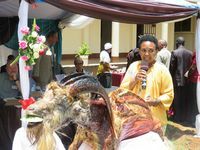 The Deputy Mayor not only opened the "Sweet & Bitter" show in the "Make Chocolate Fair" campaign there. In response to the applause, he also announced that the city retains the FTT seal. The title, which was initially awarded for two years in 2013, was extended for another four years following an examination by Fairtrade Deutschland. 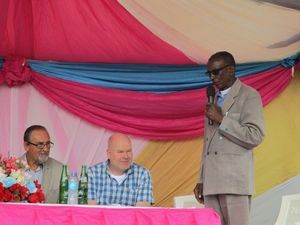 At the start of the exhibition, Rübner welcomed not only the members of the local FTT steering group but also Pracseda Towo from the Tanzanian Rafiki partner municipality Mrimbo as well as Markus Schwarz from the alliance Eine Welt Schleswig-Holstein (BEI). He found fair trade products in a tour of all major stores, according to Rübner. 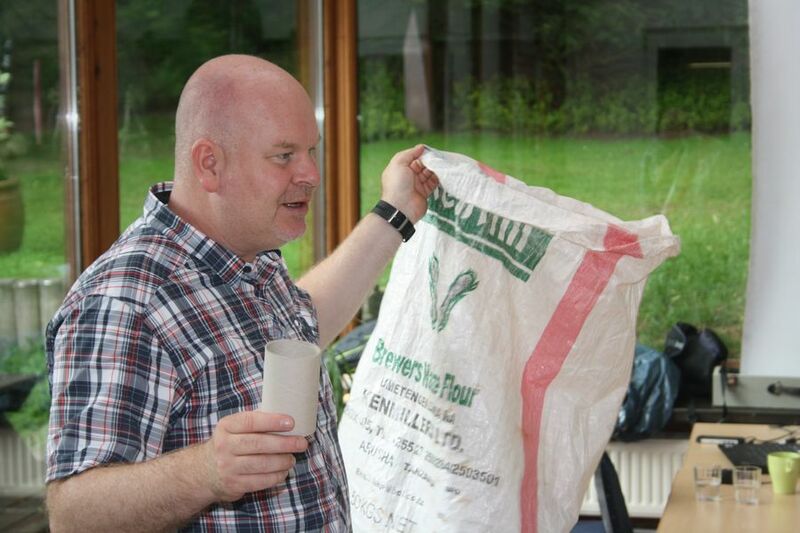 "Sugar, rice, tea, coffee and bananas with seals all suppliers have on the shelf." This shows that the trade takes on the topic. Fair trade chocolate, whose "sweet enjoyment and bitter truth" is the central theme of the show, was in many variations. Among other things, the small exhibition shows the path of the cocoa bean to chocolate at five discovery stations. Above all else, fair trade meant that producers would receive a decent wage for their work, he pointed out. 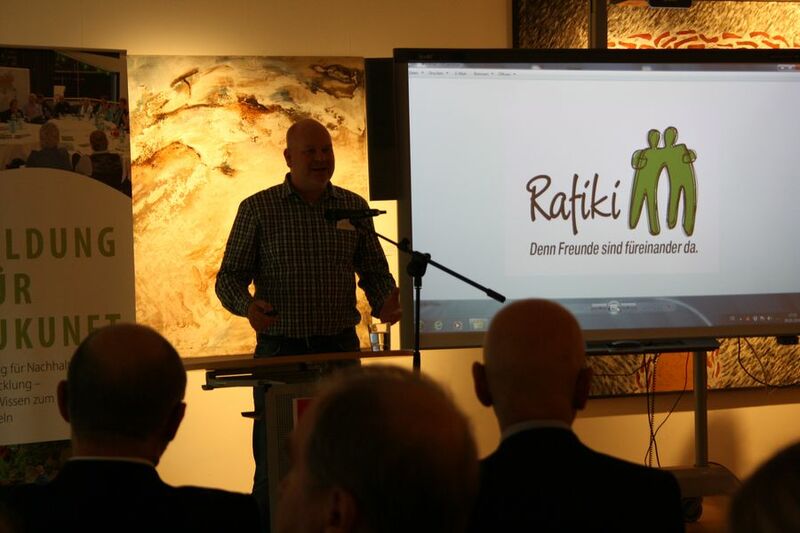 The exhibition, organized by Inkota Network, came to the city on the suggestion of Markus Schwarz, "who regularly provides us with information," said Oliver Zantow, member of the Fairtrade steering group. 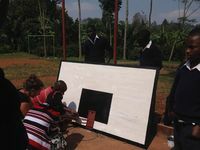 The show was set up with a video and audio station as well as visual aids and information material with the help of other members as well as the BiBeKu and the city marketing, Zantow thanked all involved helpers. 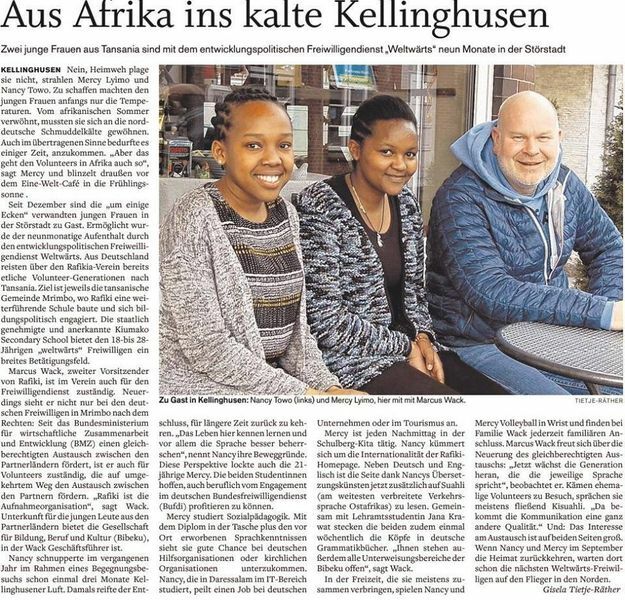 On the FTT status he said: With calm but continuous strength Kellinghusen has managed to become one of the first cities in the country Fairtrade Town. Also on site, it should be stated: "Fair trade is on the way out of the exotic niche to the mainstream." But it's not just about the end consumers who decide with their shopping for fair wages, added Schwarz. Above all, the manufacturers would have their promises on fair conditions for the producers to redeem.